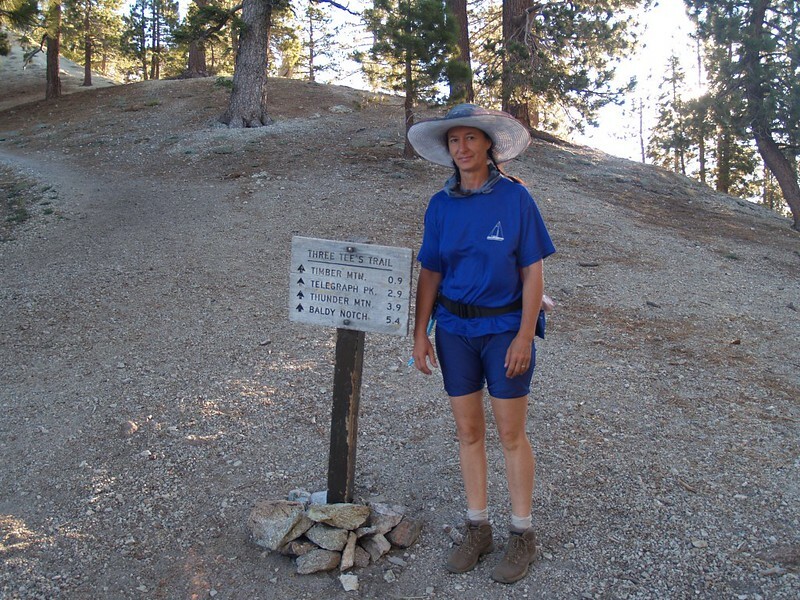 Last year (June 2010) Vicki and I backpacked up the Icehouse Canyon trail to Kelly Camp for two nights, and devoted the middle day to day-hiking Ontario and Cucamonga Peaks. 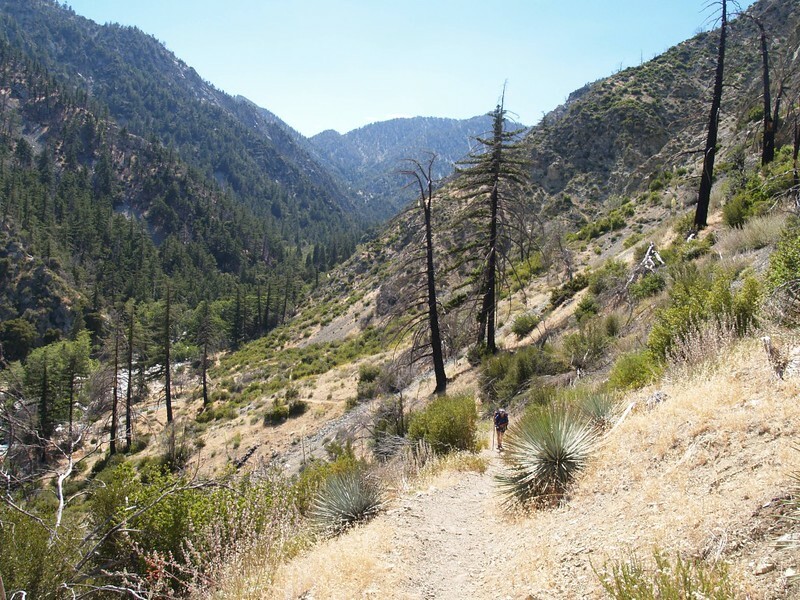 We had a lot of fun, but, not surprisingly for a Saturday arrival, Icehouse Canyon was insanely crowded. 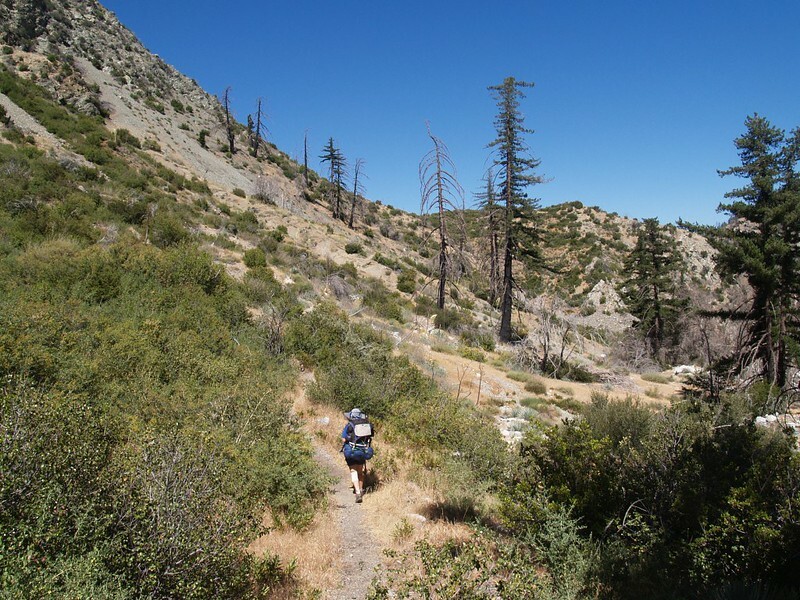 This year we decided to head back to Kelly Camp once more, but via the eastern route, up the Middle Fork of Lytle Creek. 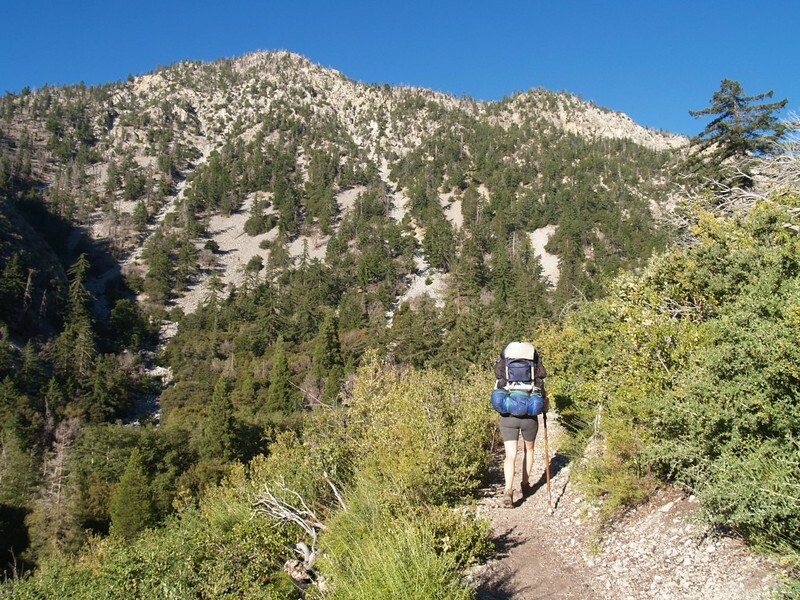 The trail starts lower, at about 4000 feet elevation, so we decided to hike it over two days, staying Saturday night at Commanche Camp, elevation 6100 feet, followed by a two-night stay in Kelly Camp, elevation 7800 feet. And, as predicted, it wasn’t crowded at all. Just the way we like it. 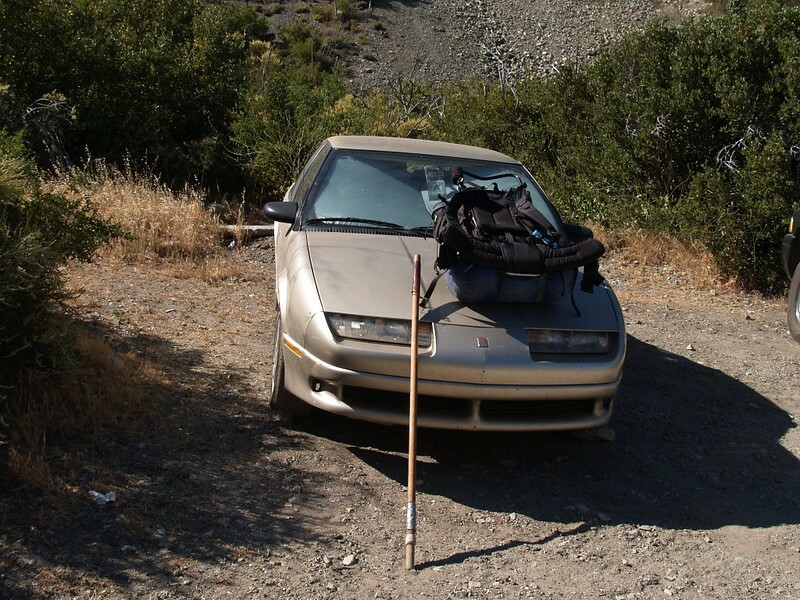 The dirt road up to the parking area was a little rough in spots, but was no problem for our old front-wheel-drive Saturn. We just drove slowly on the bumpy parts. We arrived as dawn was breaking, after a 2 1/2 hour drive from San Diego. We wanted to hike in the cool of the morning, as it was predicted to be a warm day. 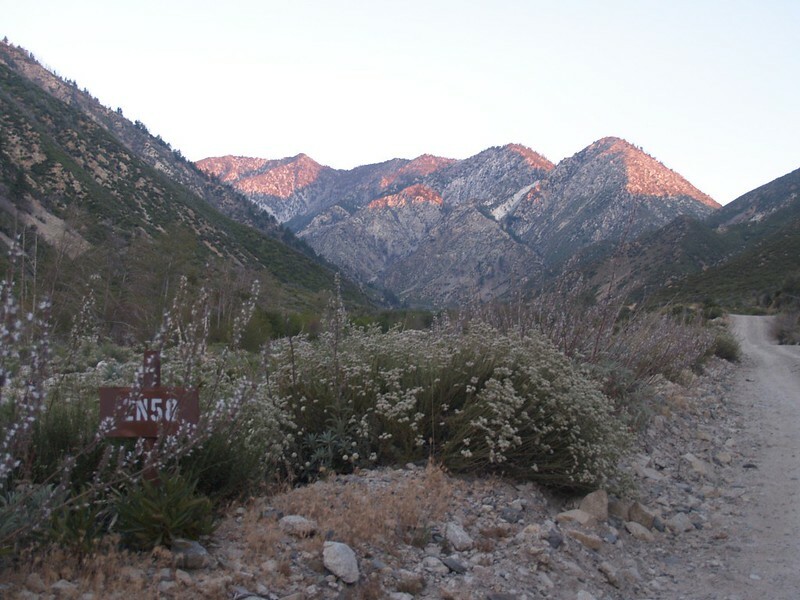 Beginning of the dirt road, 2N58, that leads to the trailhead. 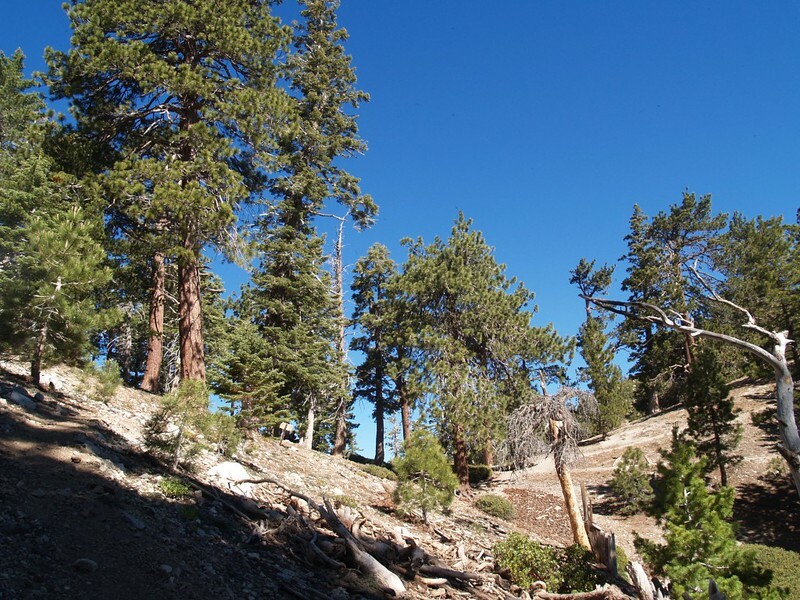 The trail up from the parking area was relatively exposed and sunny, and the pine/oak forest didn’t get shady until we neared Third Crossing camp at 5200 feet. 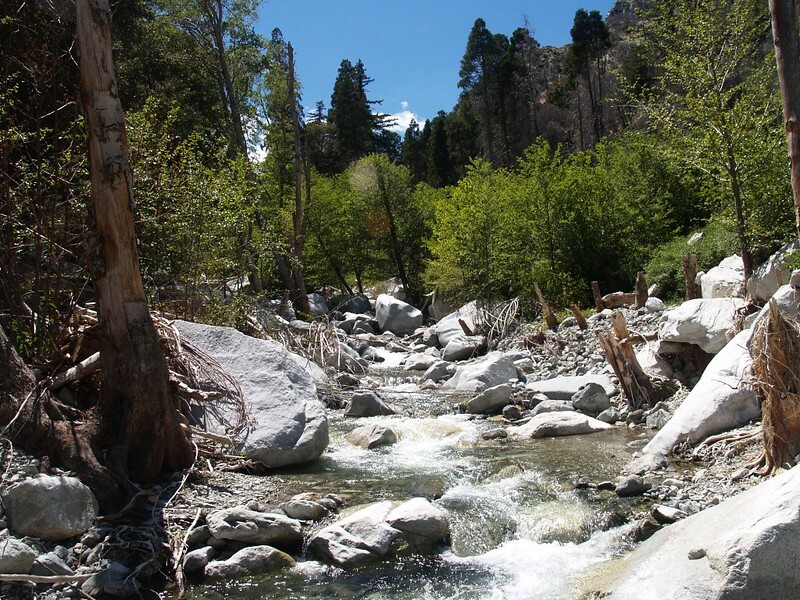 There was a troop of Boy Scouts camping there, having fun in the roaring creek. 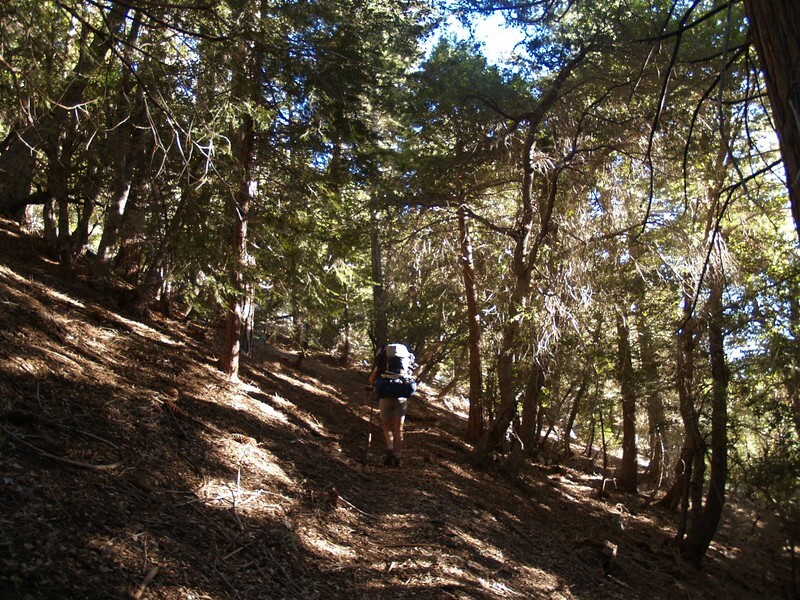 We refilled our water and continued up the switchbacks to Commanche Camp. 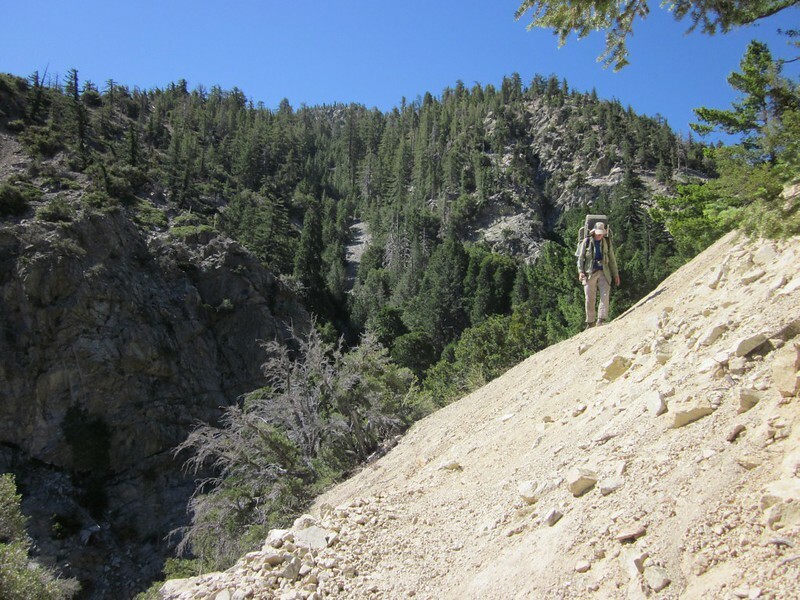 There were plenty of exposed/scary scree crossings along this section of trail (Vicki has a fear of these areas, but I don’t). We set up our tent under a huge old cedar tree in Commanche Camp. 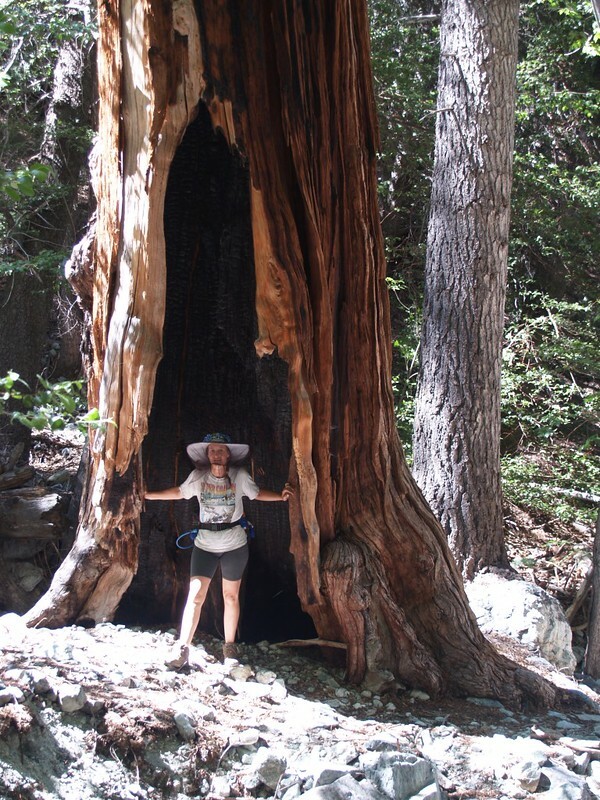 We’d never been here before, and were happy to discover that it was a nice, cool, shaded campsite with plenty of lush gooseberry plants lining the trail and stream. Too bad the berries weren’t ripe yet! 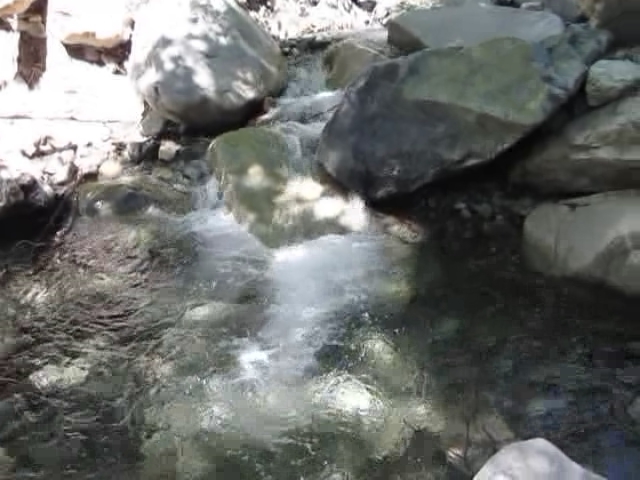 It was nice to hear the sound of running water nearby. 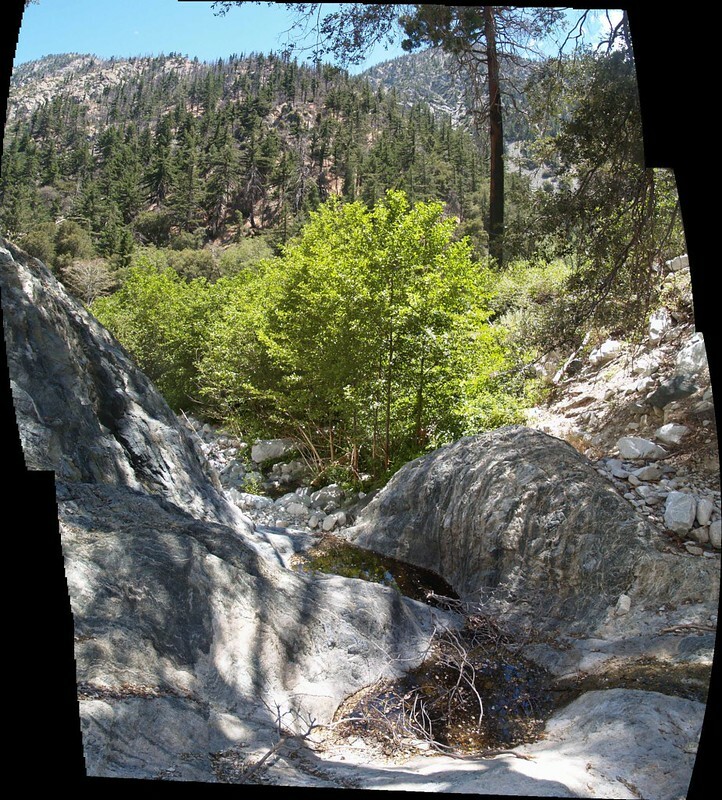 The stream and the lushness made up for the lack of views, so different from most camping spots in the Southern California mountains. Also, we were the only people camped there. On a Saturday night in the summer! Very nice! After taking an afternoon nap, we hiked back down the creekbed to an area where we’d seen a tall waterfall from the trail up above. We didn’t attempt to descend the falls, not having any equipment/ropes/wetsuits for canyoneering. 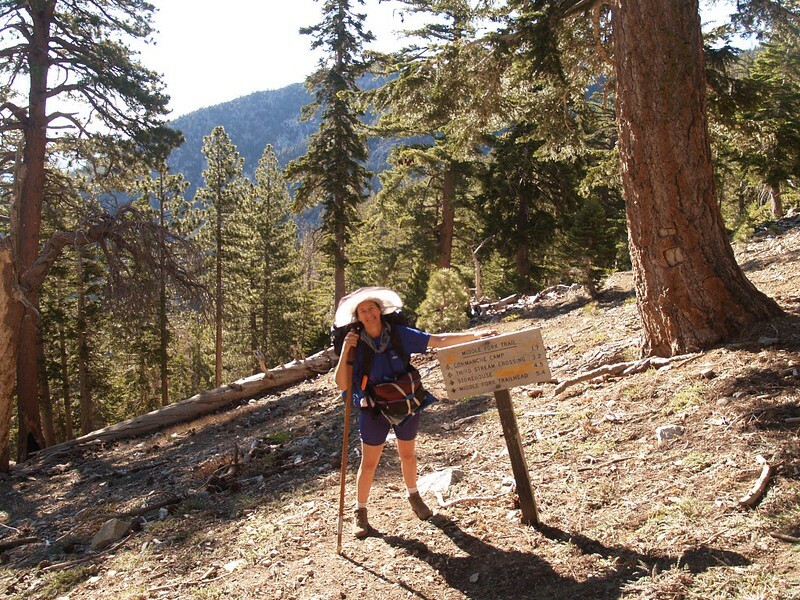 Hiking up the Middle Fork Trail. Lots of sun on this south-facing slope. 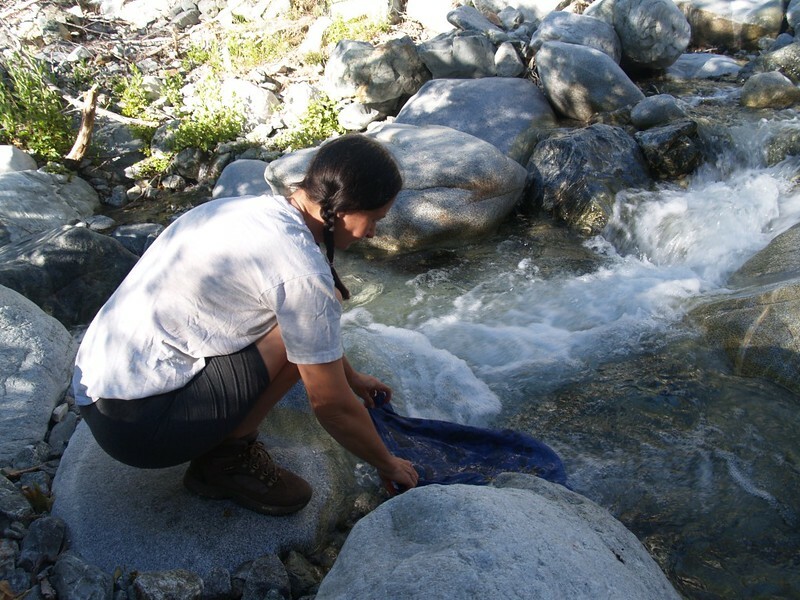 Vicki soaking her bandanna in the creek. It was a hot day! 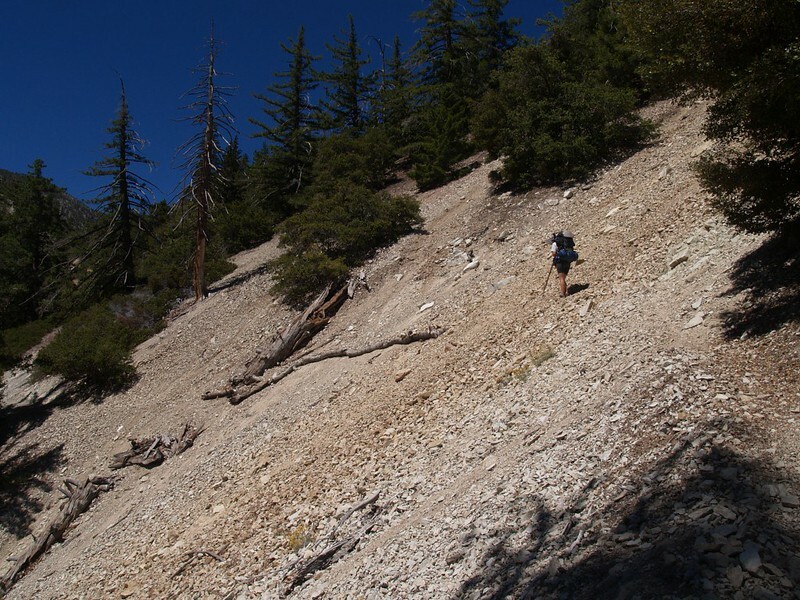 One of the huge scary scree-fields along this trail. 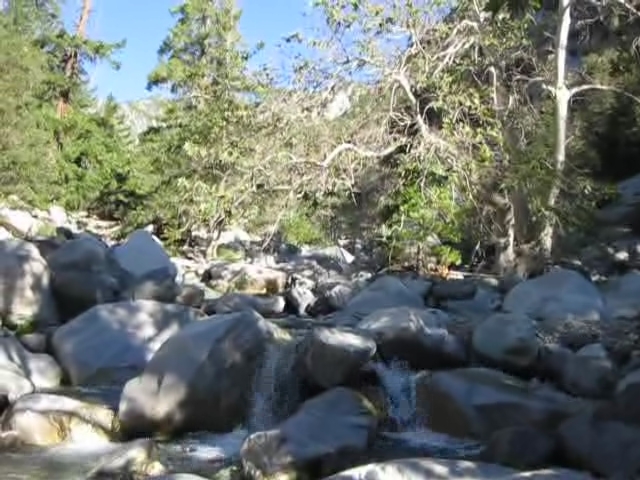 Down below is a deadly drop-off onto a rocky creekbed. Walk carefully! 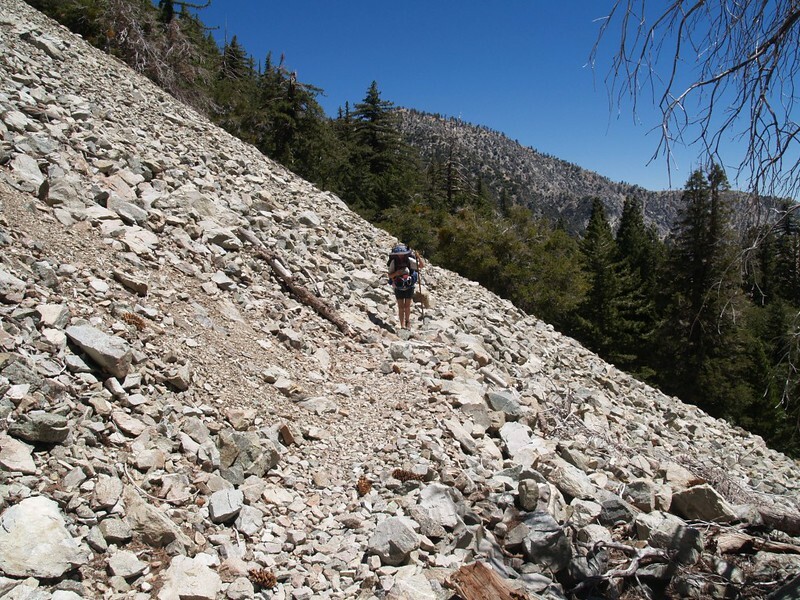 Another huge scree-field along this trail. This one was less scary, as the scree rocks were large and non-sliding. 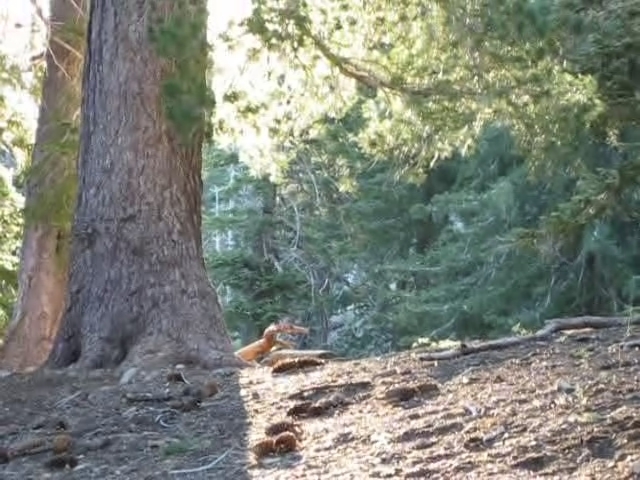 They made clinking sounds when walked on. Nice soft gooseberry plants caressed Vicki’s legs as she walked through them. We went to bed before sunset and woke at the earliest possible light at 5am. We ate breakfast, broke down camp, and were hiking by 6:45am. We had a lot of uphill yet to do that day. 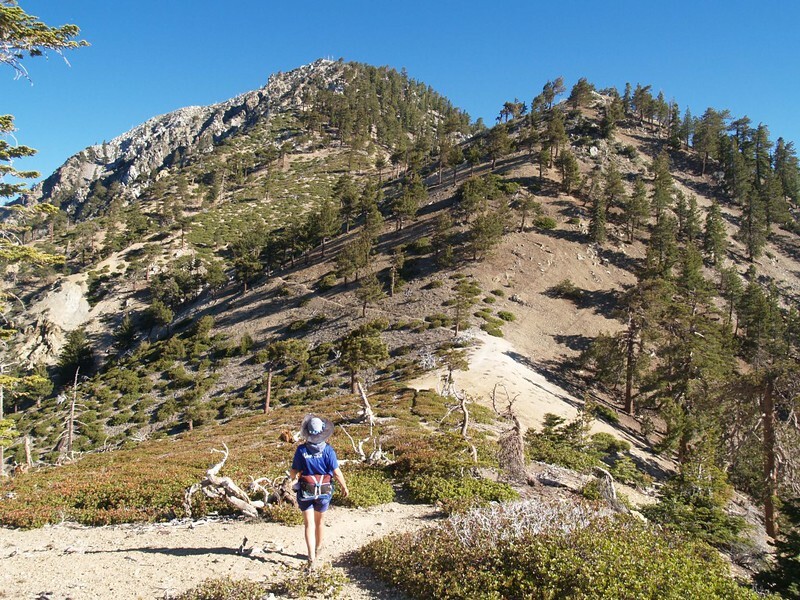 It looked short on the map, but there was a lot of climbing, and there were many switchbacks and scree traverses on the trail up to Icehouse Saddle. The saddle had the usual small crowd of people, but we left them behind and headed to Kelly Camp. We met a boy scout troop just leaving as we headed in. 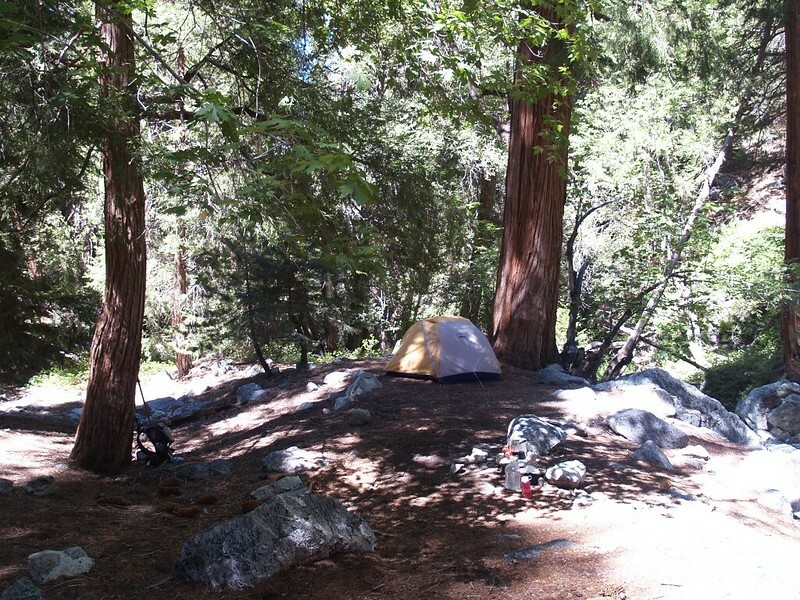 We set up our tent in a secluded spot around the side of the camp, not far from the spring. 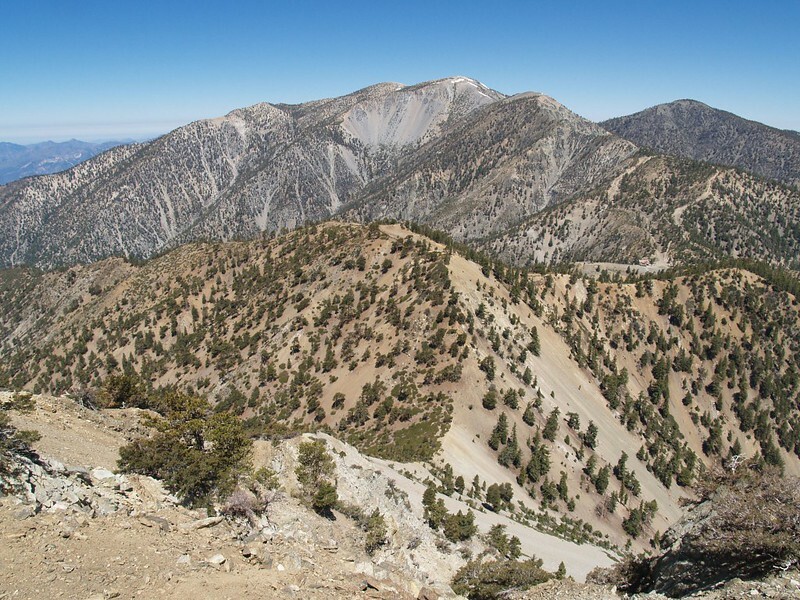 It was nice to be back here again, with the excellent views of Mount Baldy to the northwest. 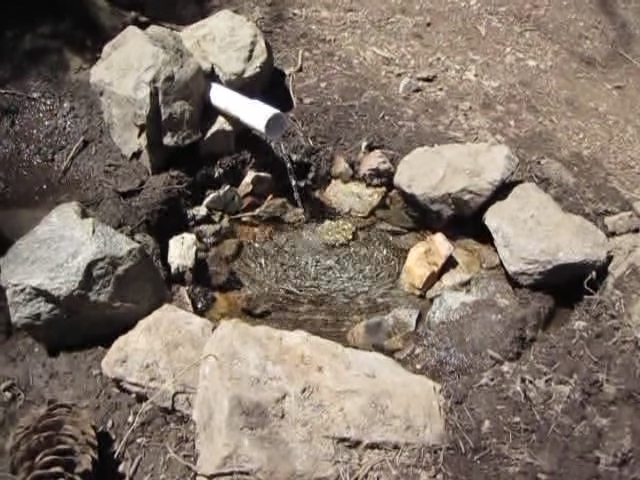 Also, the rebuilt spring at Kelly Camp was working perfectly. And, to make things nice, we only had two neighbors that night, two gents who spent Sunday hiking the Three Tees Trail. 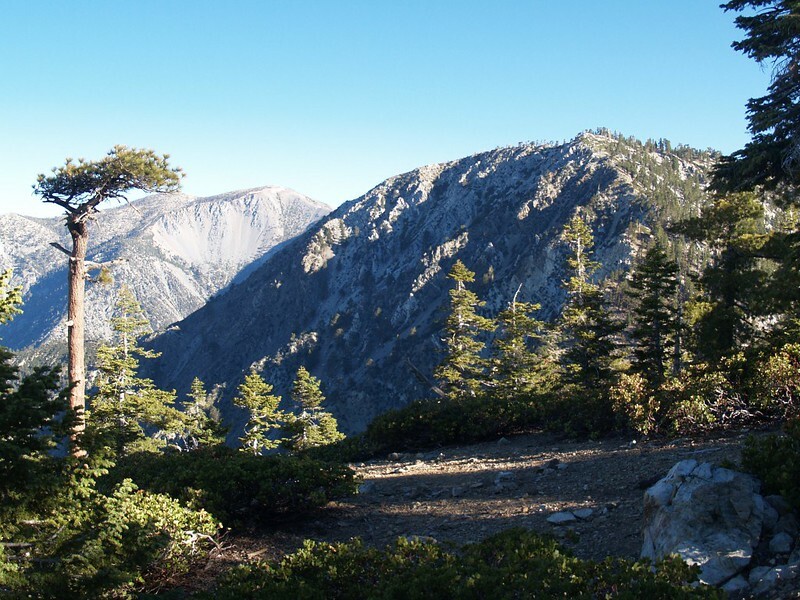 After we set up camp, we day-hiked up above camp to the overlook, then traversed along the ridge and climbed Bighorn Peak (elevation 8441 feet). 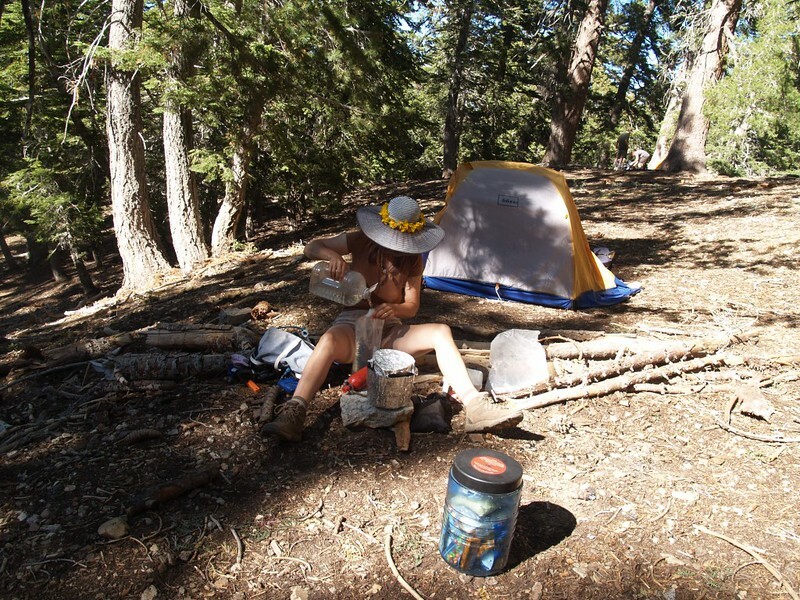 Back at Kelly Camp, we ate a freeze-dried lasagna dinner and conked out well before dark. It had been a long day. 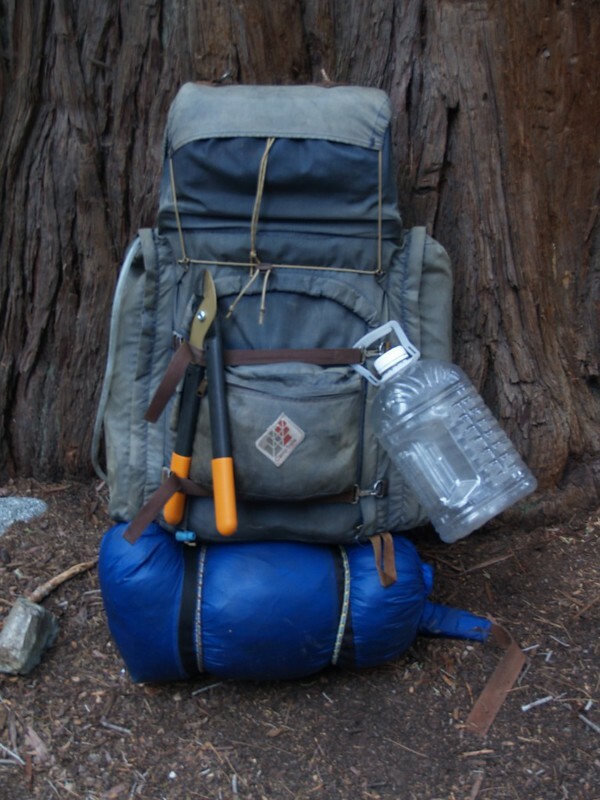 My Backpack with Loppers. I was glad I carried them, later on, on the way out. The loppers are very light, made by Fiskars. 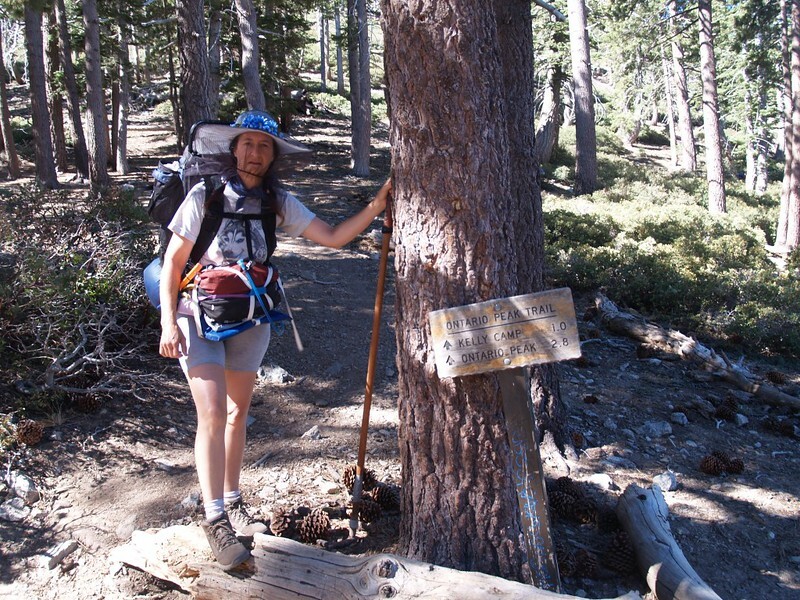 The water jug is empty and we use it to store water for use in the campsite, not while hiking. 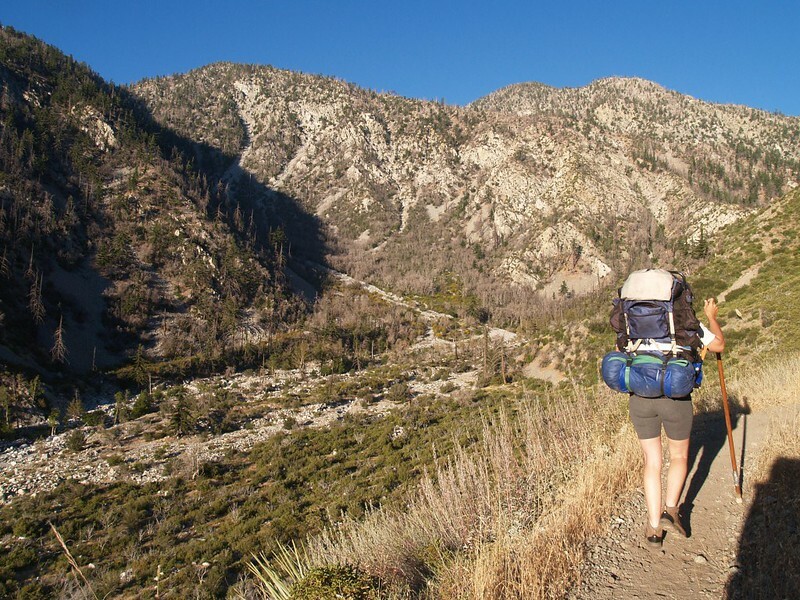 This is an OLD external-frame Camp Trails backpack from the mid-1970’s – still going strong. They didn’t have internal-frame packs back then. Hiking through a shady oak forest, the ground littered with leaves and acorns. Icehouse Saddle is way up there above us. Ontario Peak Trail Sign at Icehouse Saddle. Vicki is still wearing her anti-bug hat, for the gnats. Kelly Camp. We found a smaller spot off to the left above the spring, leaving the large area for groups to use. 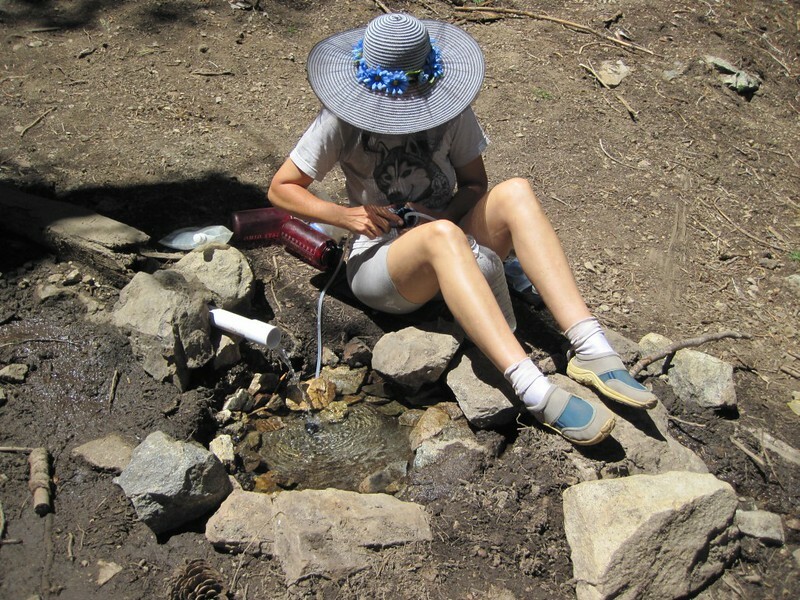 Vicki pumping/filtering water from the new spring. Bighorn Peak Trail 7W08A Up on the Ontario ridge overlooking Los Angeles, Santiago Peak in the distance. 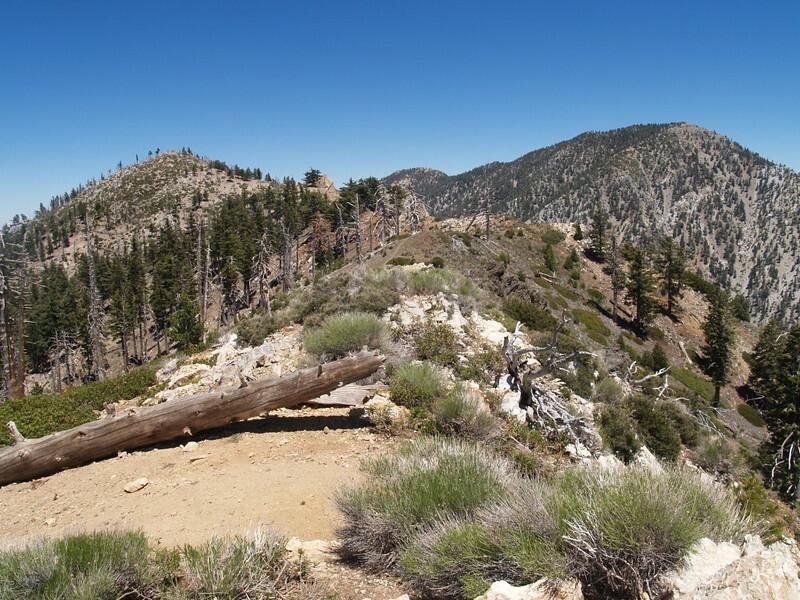 This trip we used our “extra” day to hike the Three Tees Trail (Timber Mountain, Telegraph Peak, and Thunder Mountain), but opted to stop at Telegraph Peak, so we only bagged two of the T’s. Thunder looked too civilized, anyway, with the ski lift on top, and climbing an extra 1200 feet simply to reach a spot that any tourist with a lift ticket could “climb” was less than inviting. I took some telephoto pictures of it, instead. 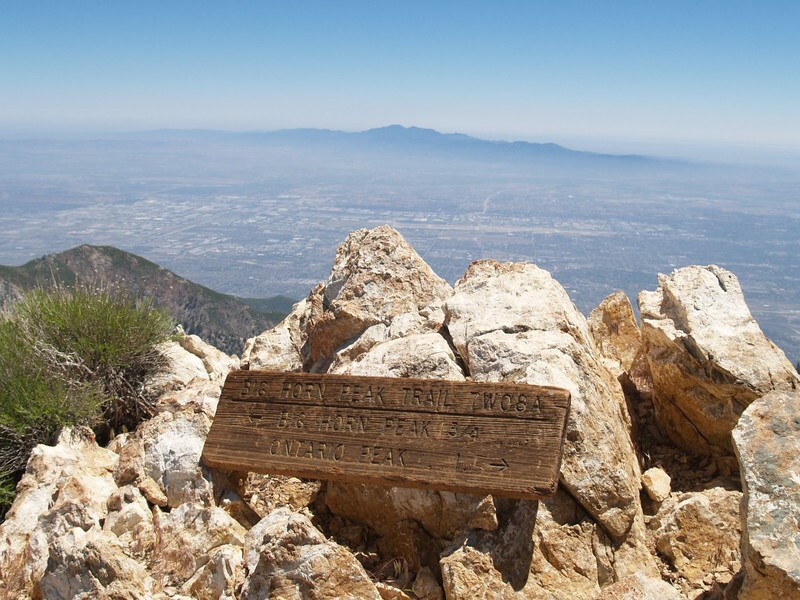 I guess I’m not a “real” peak-bagger! 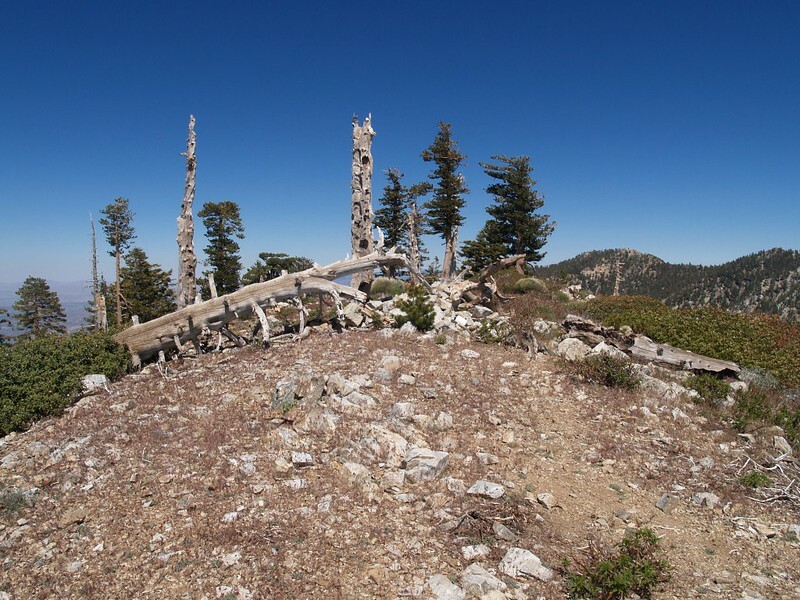 The views from Telegraph Peak (8985 feet) were excellent. 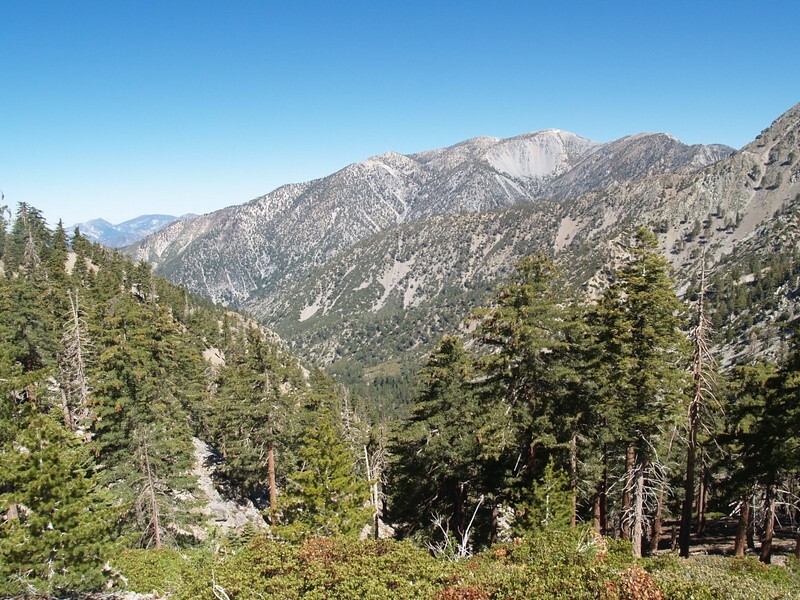 We saw San Gorgonio and San Jacinto through some cool-looking horizontal bands of haze, and off to the north we could just barely make out the snowy summits of the southern Sierra Nevada mountains. That’s some long-distance viewing! 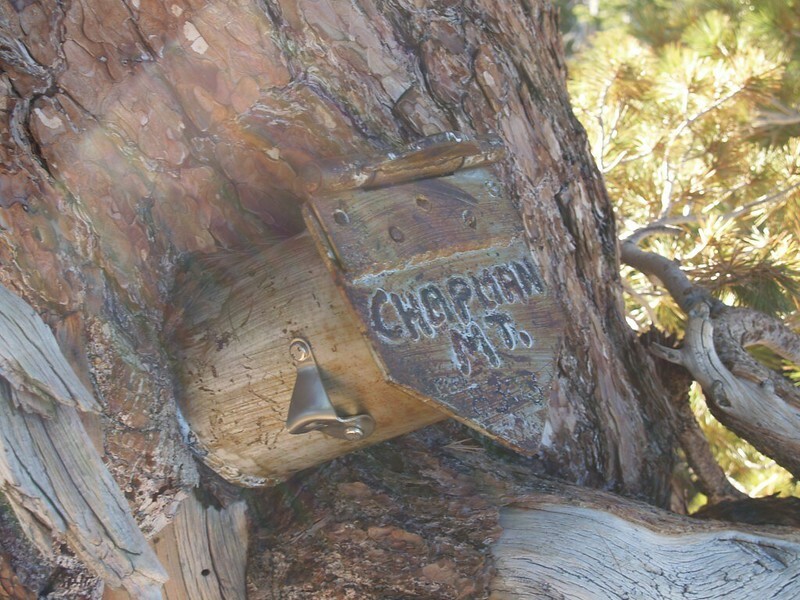 Timber Mountain Register (Chapman Mt is the old name). Nice beer bottle opener! 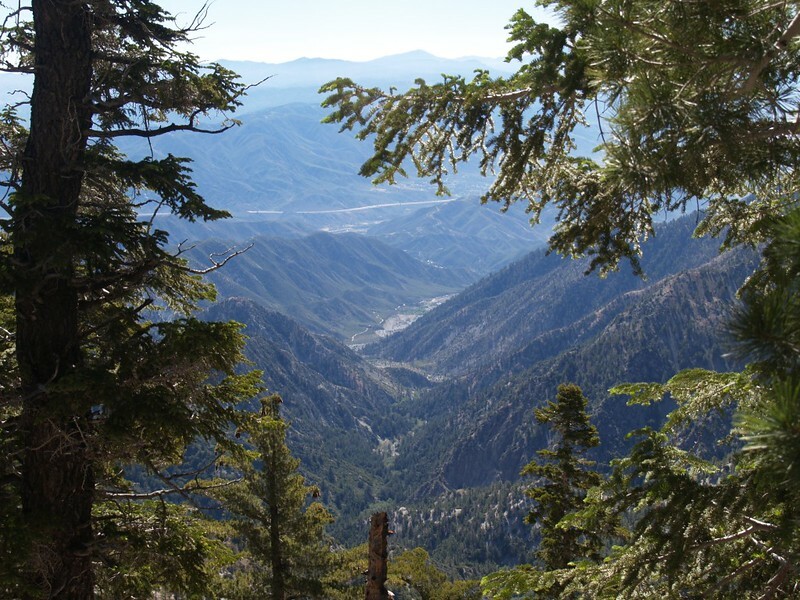 Middle Fork Lytle Creek from the upper slopes of Telegraph Peak. Our car was down there somewhere. 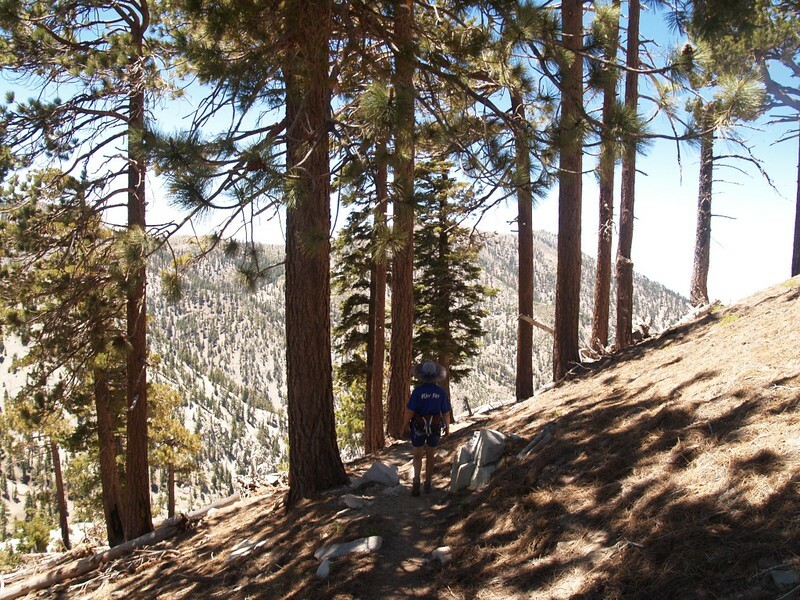 Nearing the end of the trail at Icehouse Saddle. This being a Monday, we didn’t find anyone there, which was nice. Far different from the weekend crowds. 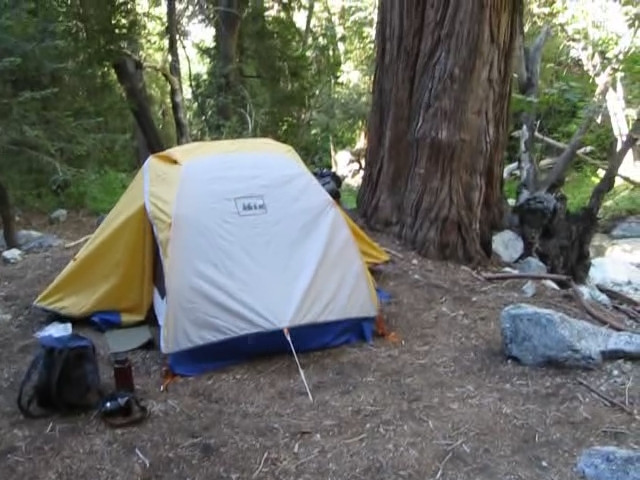 We thought that we were going to have Kelly Camp all to ourselves that night, but just as we were falling asleep (it was still daylight) we heard some voices. Some people were wandering all around, looking for the spring. I got my clothes and shoes back on and went out to greet our new neighbors, a couple of nice guys who said that they hadn’t been up here in twenty years, and had forgotten the precise location of the spring. I showed it to them, but they would have found it eventually. The next morning we were up at 5am, as usual, and were already hiking by 6:30. Record time! Our neighbors were still snoozing. 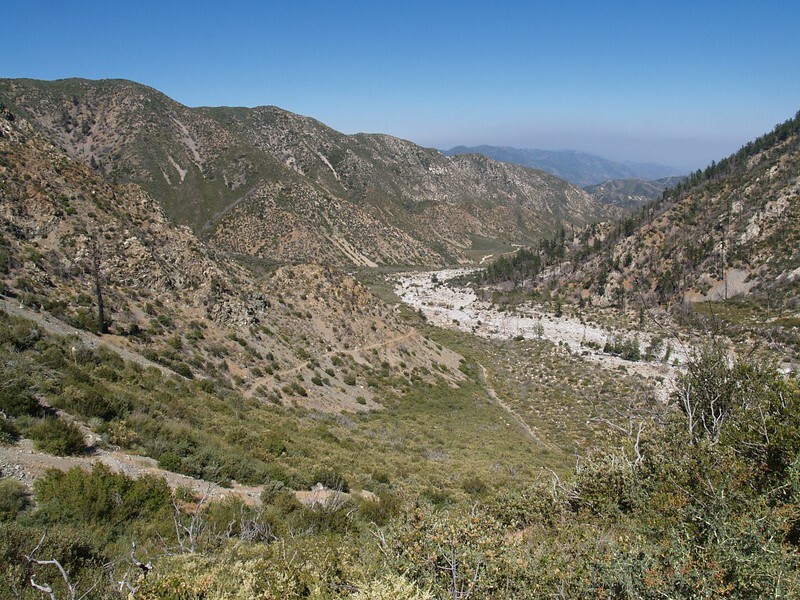 The hike down the trail was relatively uneventful, sunny and warm with gnats/bugs and long scree crossings. 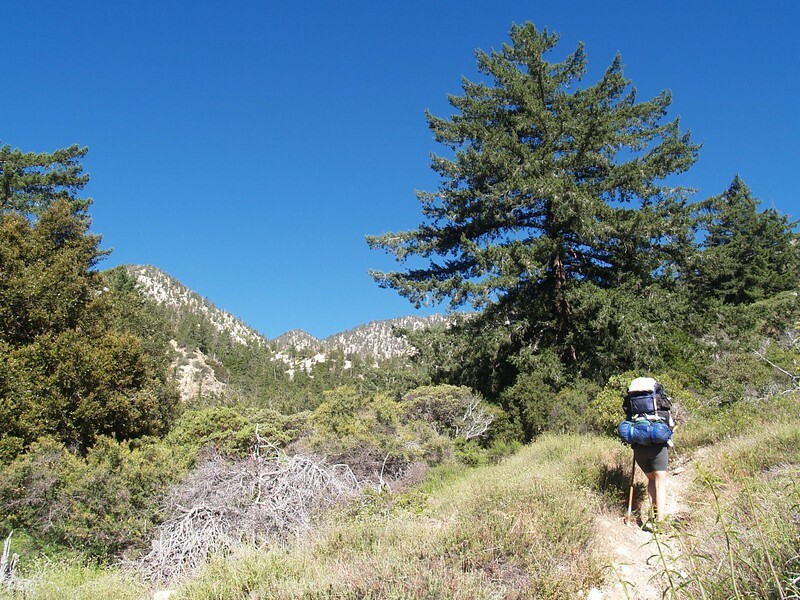 We ate some snack at Commanche Camp, refilled our water supply, and continued down the trail to Third Crossing, where we took off our shoes and cooled our feet. Ahhh! Vicki stuck her feet in the icy water and I doused my head. It was cold! 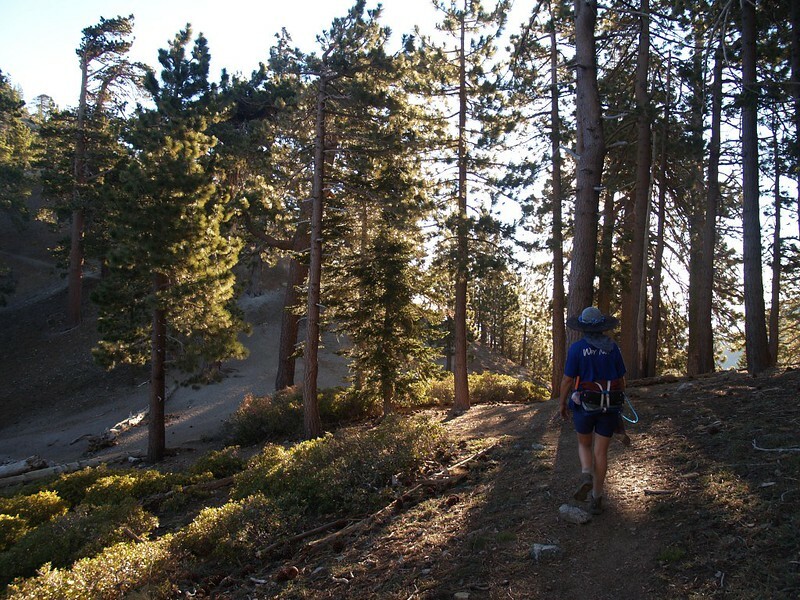 Morning on the Trail. 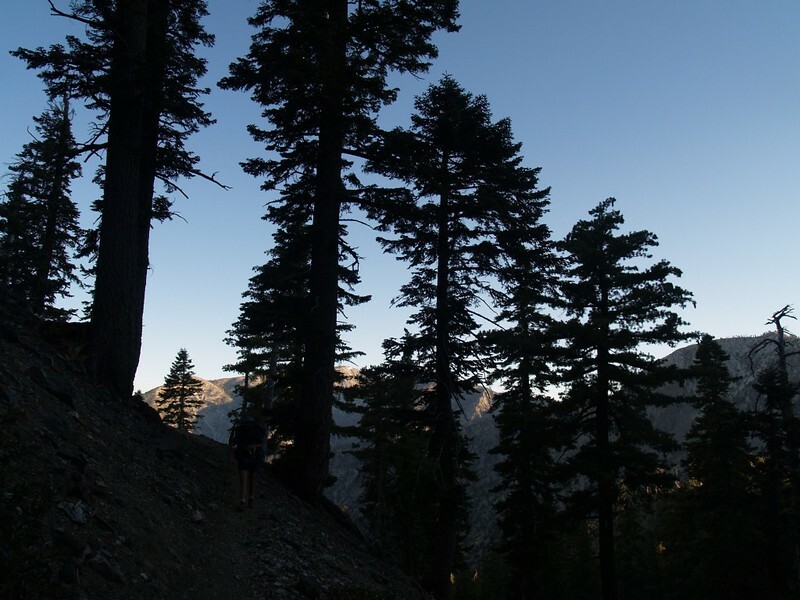 Early morning silhouette of pine trees on the Kelly Camp Trail. 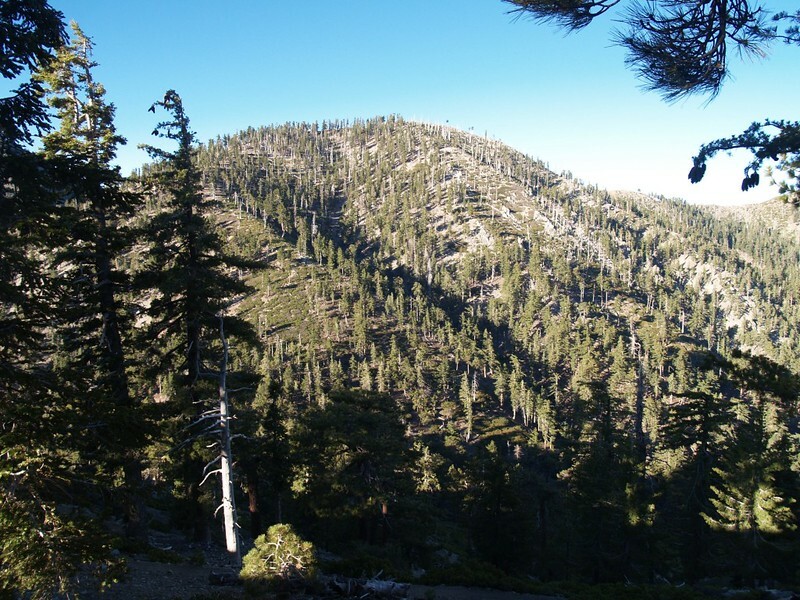 Mount Baldy is lit in the background. 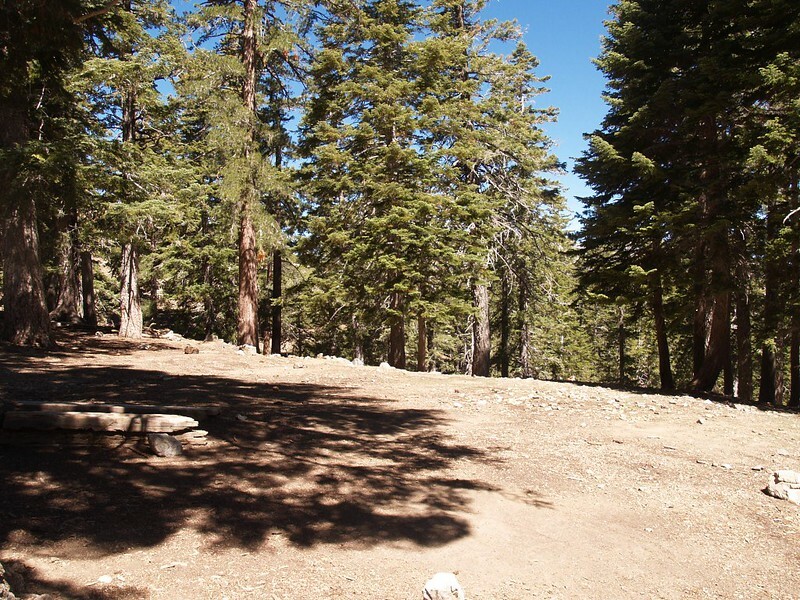 Panorama shot of the Third Crossing Campsite. Plenty of room for tents here, and the stream is right next door. 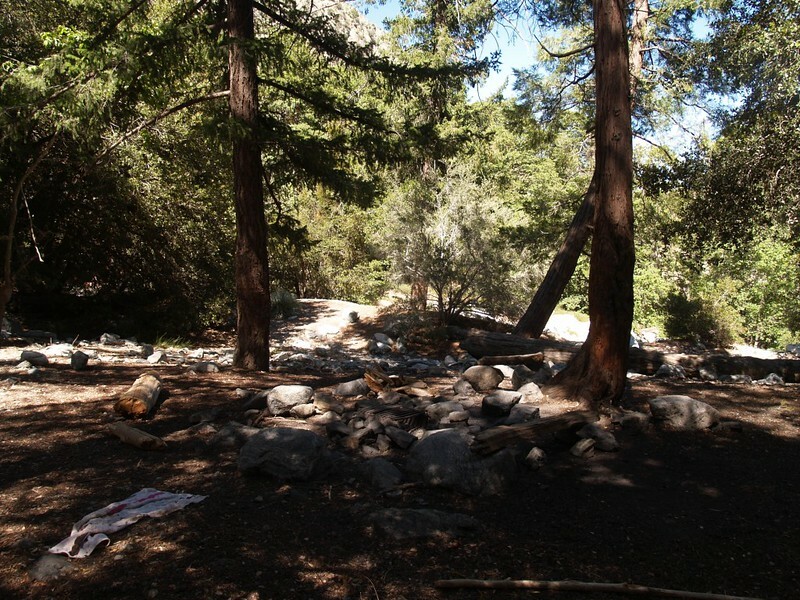 There was only one campsite on the Middle Fork Lytle Creek Trail that we hadn’t visited yet: Stonehouse Crossing. According to the topo map, there was a lower trail that swung through this campsite, and we wanted to hike along this route, rather than staying on the main trail that runs high above the valley floor. 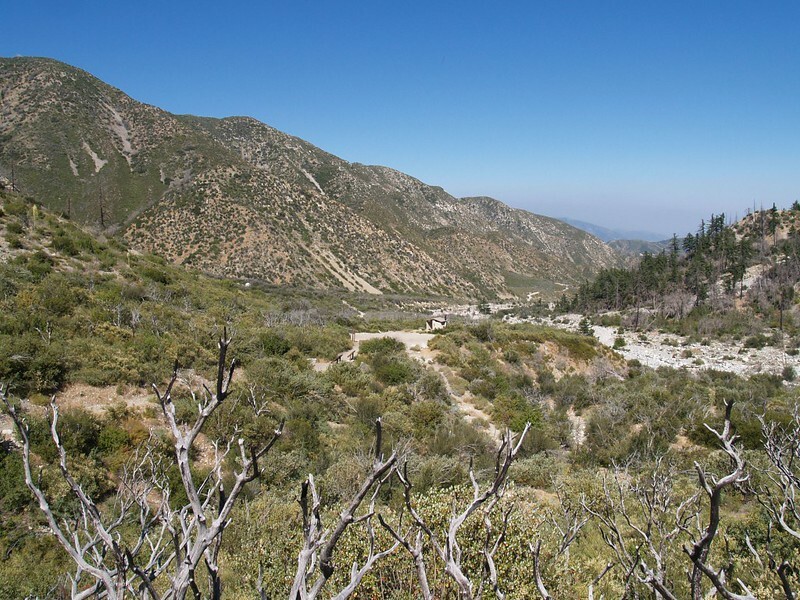 The old/rarely-used trail began just outside of the Cucamonga Wilderness Boundary. 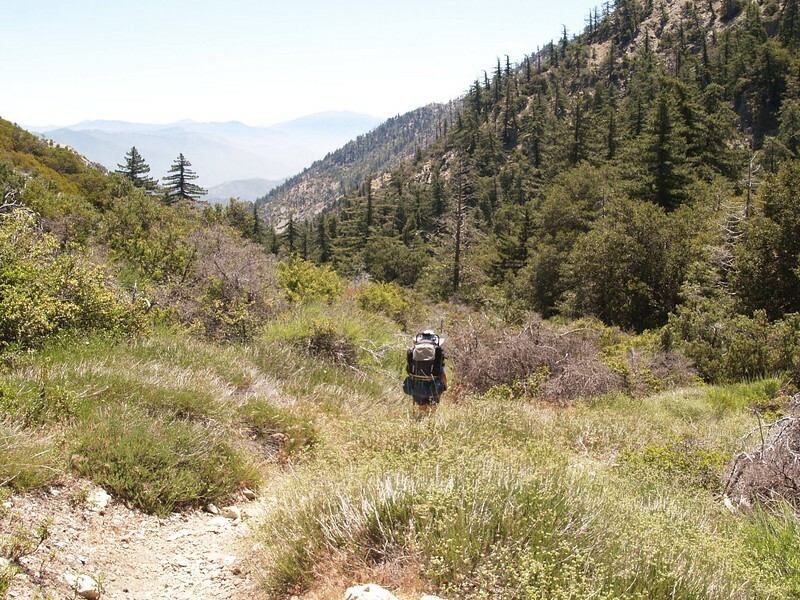 It was easy to follow for a while, but it eventually headed toward the creek and dead-ended in a huge thicket of raspberry vines and other green viny plants. 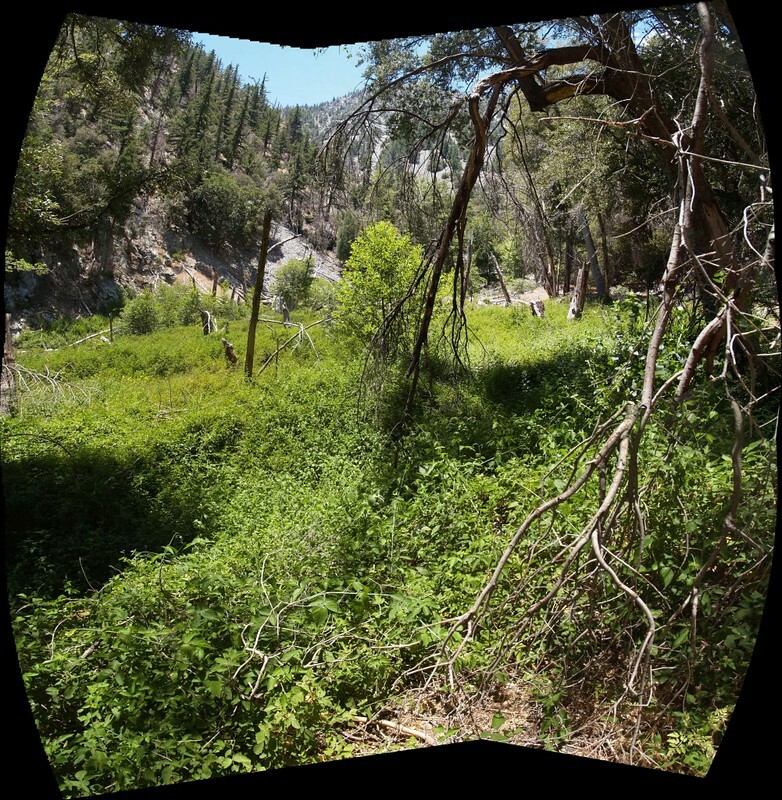 The trail was completely overgrown, and my gps showed nothing useful, as it doesn’t have every trail in its database, and it isn’t always all that accurate, or at least it hadn’t been for much of the weekend’s hike. And that’s when the adventure started. Stonehouse Crossing trail thicket. To Enter or Not to Enter? We decided to bushwhack our way into the viny zone. 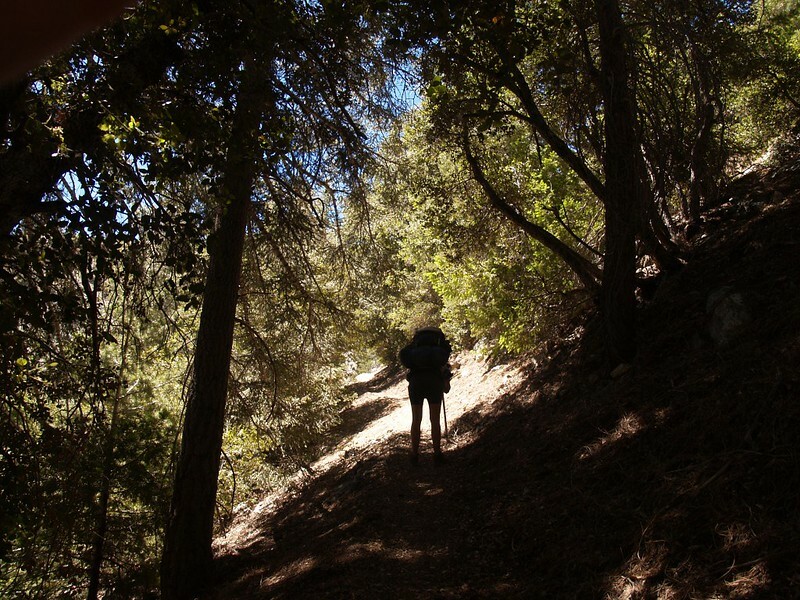 We’d head for the creek, where we’d be able to walk better, and maybe we’d pick up the faded trail. No problem, as we could always backtrack. But the footing under the vines was treacherous, and there was a small stream flowing underfoot. The raspberries had tons of thorns, and Vicki was wearing shorts, so I tried my best to stomp everything down for her, but of course she got scratched anyway. 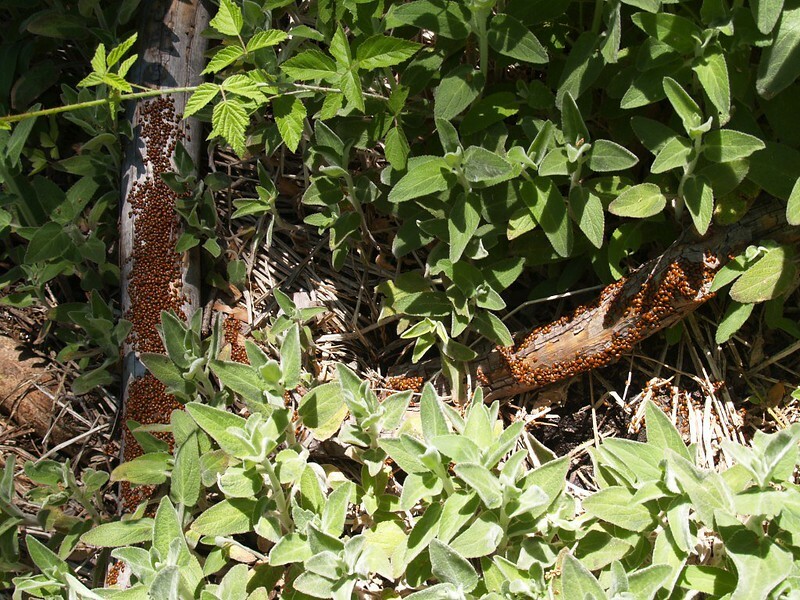 We ran into a massive hatch of ladybugs, which was very impressive, but it didn’t help us find the trail. We finally made it (less than 100 feet!) 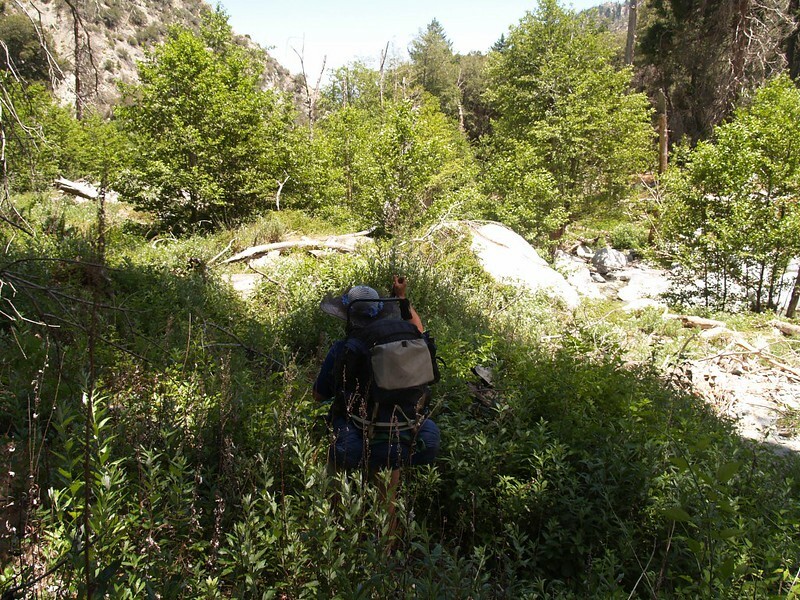 to the creek, and found that the boulders were too huge to hike over, and the creek was too strong to cross. Meanwhile, were we sure that we should cross it? We didn’t know. Massive hatch of ladybugs! We tried our best to avoid stepping on them. So we backtracked. No problem. 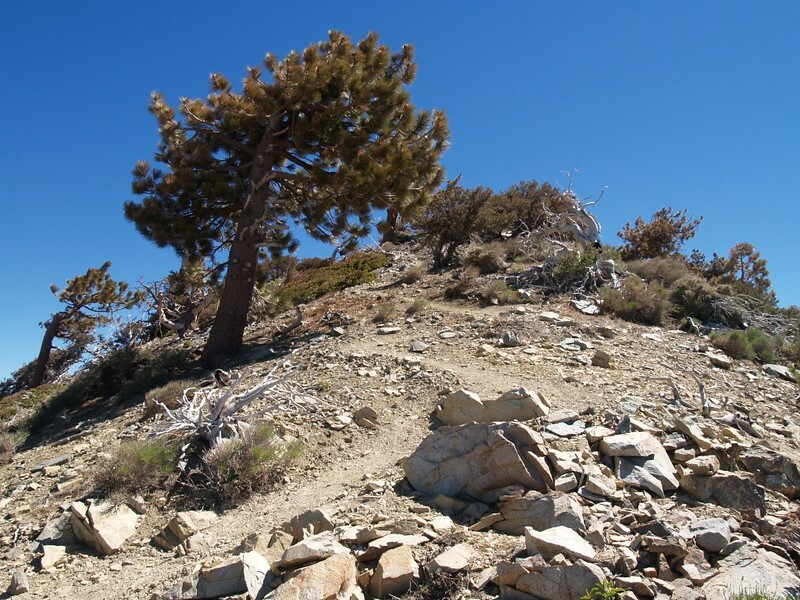 But we didn’t want to go all the way back, so we headed uphill through the viny zone to try to find the missing trail. After much aggravation, climbing over vine-covered downed trees and watching out for running water and other hidden surprises, we finally attained higher ground. But no trail. And the higher ground was covered in six-foot-tall buckthorn bushes. And it’s the “thorn” part of Buckthorn that makes them so fun. At this point, I wanted to say “No problem, we can always backtrack” but it really wasn’t true anymore. That last whack was tough. Since the Boy Scout motto is “Be Prepared”, I whipped out my trusty loppers and carved a path into the buckthorn patch. This isn’t so bad, I kept telling myself. But it was. We had descended into the mental “bad zone” at this point, and were feeling unhappy with all of our decisions. 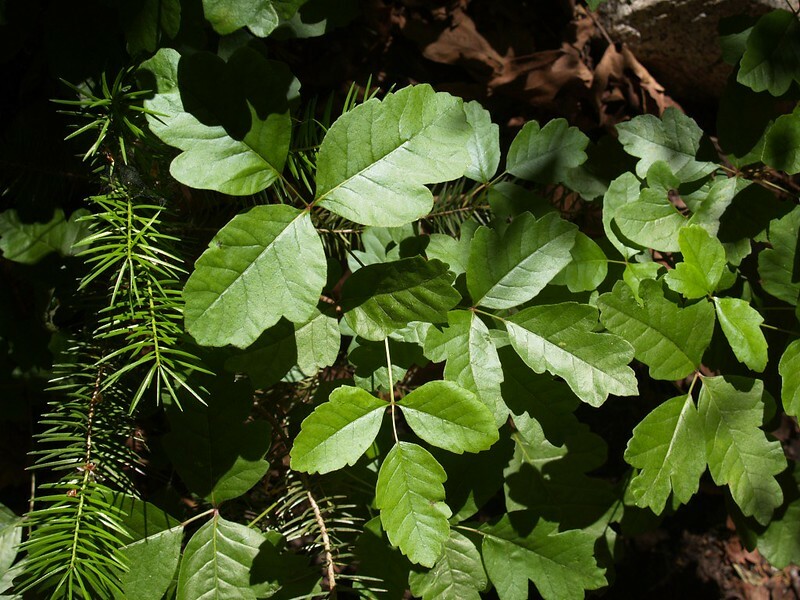 And then, with a final hammerstroke smashing the measly remains of my happiness, I looked down and saw the supremely evil “leaflets three” of poison oak within inches of my arm! NOOOO!!! 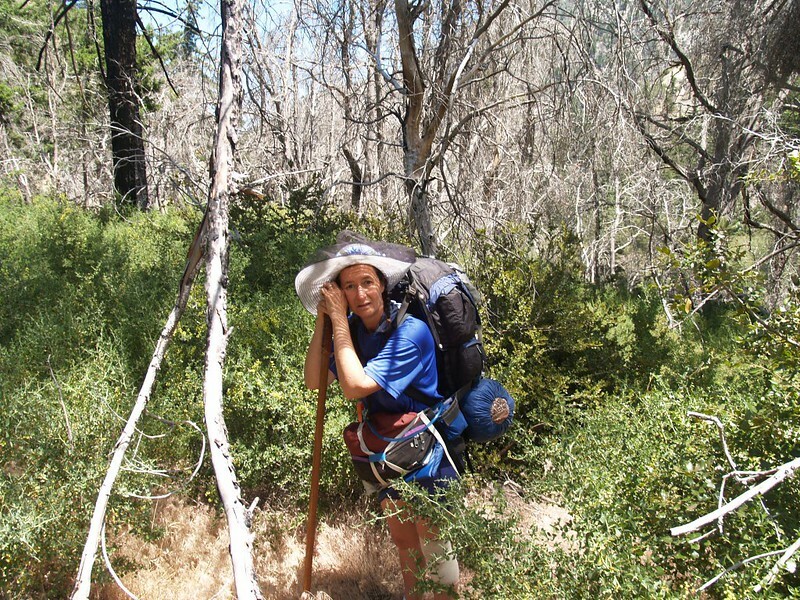 Vicki is ultra-allergic to poison oak, and this bushwhack had just turned into a nightmare that might last for weeks! I looked around me for more. Had we been stomping stupidly and blindly through it all this time? No, we hadn’t, which was good; there was a decent chance that we weren’t irredeemably contaminated, but the big question still remained: What should we do now? Buckthorn patch above the thicket. Yes, that’s Poison Oak lower center! 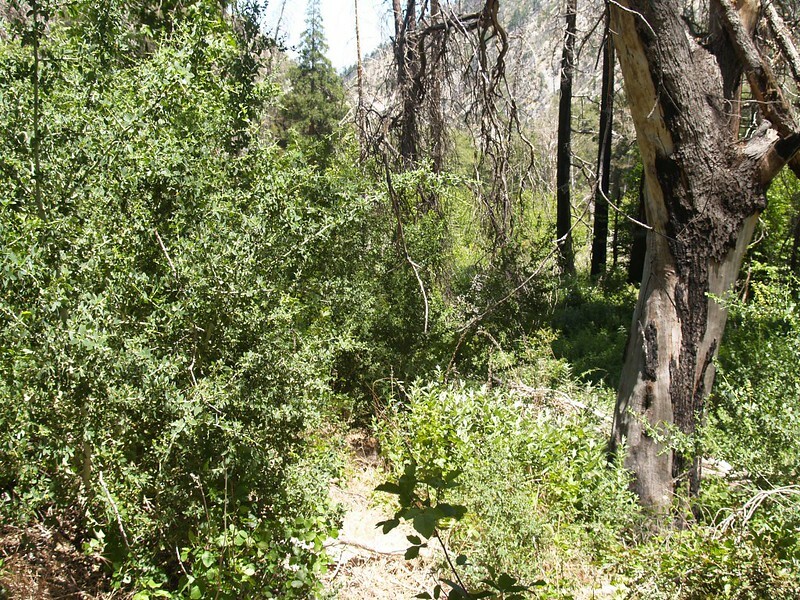 Poison Oak. Leaflets three; let it be! We tried to make a rational decision as to our options. We could continue forward through the buckthorn field and try to make it back to the upper trail high on the steep hillside a few hundred feet away, or we could backtrack the way we came. Meanwhile, it had suddenly (?) become three in the afternoon. Several hours had gone by since our last stop just upstream. How did that happen? We didn’t know, but we had to get out of there. I took the loppers and carefully chopped away the poison oak so that it wouldn’t touch Vicki, and we continued into the buckthorn. But the thorns got ever-thicker the further we went. It was slow going. We weren’t really getting anywhere; the thorns seemed endless. Surrounded by buckthorn, Vicki looks very bushwhacked at this point. The nightmare was in full swing! We pulled out the map and stared at it some more, then looked at the terrain in the canyon. Stonehouse should be just downstream, like we originally thought. Should we try going back to the stream again? But via a new route? I zoomed in on the gps and saw our crazy track meandering all over the valley floor. It would take another hour or two just to go back. Not much of an option. But did we really want to go even further on the new route? We resolved to dare it. We decided to continue east into new bushwhackable territory, traveling through a small stand of larger trees. At this point things began to improve, as the buckthorn decreased in size and ferocity in this shadier area. 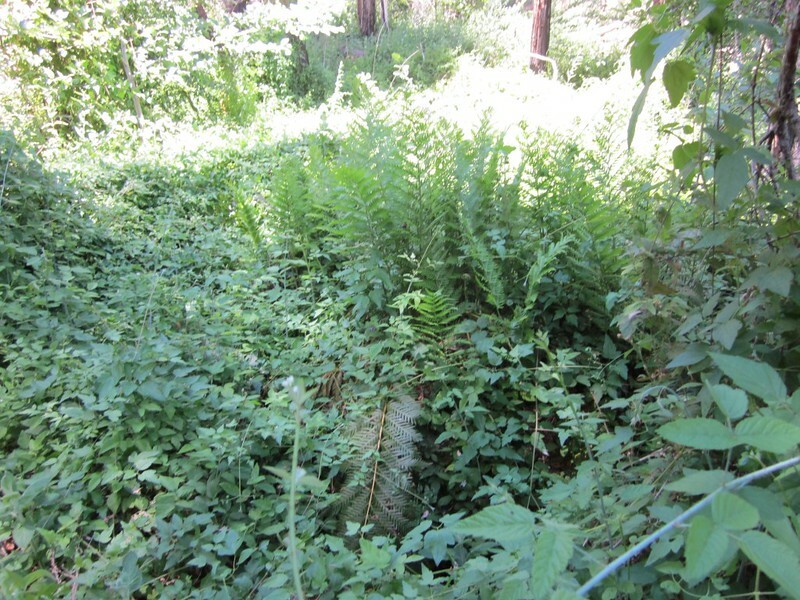 We eventually reached a deeply-trenched side-ravine that emptied into the main creek. If we could only get down into the ravine below us we could use it to reach the big creek, and possibly even the Stonehouse campsite. 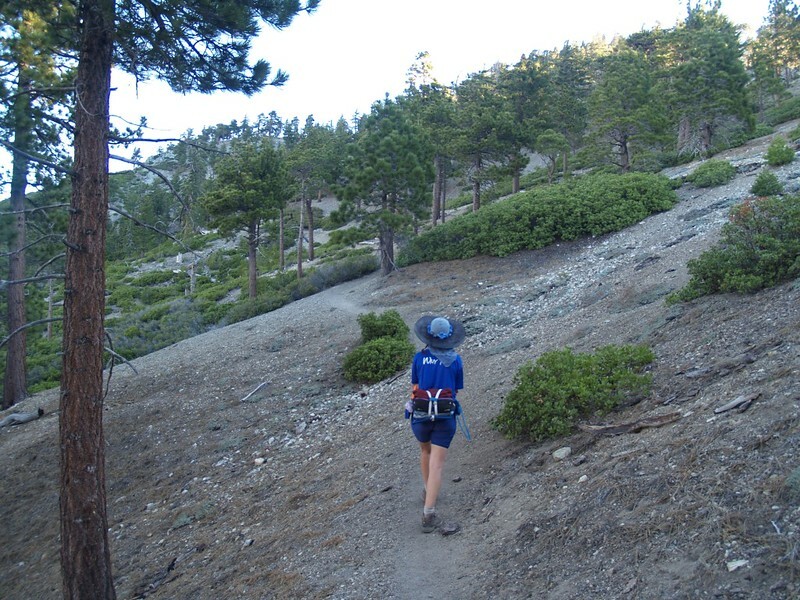 We found a steep yet climbable path down, then walked along the smooth-bottomed dry rocky ravine until we reached the running creek. Not far upstream, we found a log across the creek that looked as if it had been placed by humans. Yes! We crossed the creek and walked downstream through some nice woods. Things were looking up at this point, and we were feeling much better. 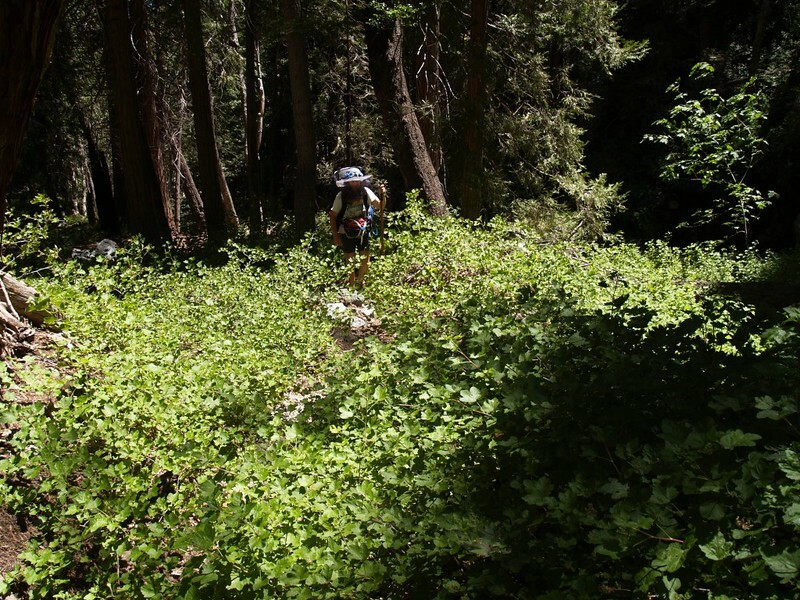 Anything was better than the buckthorn field, the poison oak, and the thorny raspberry thicket! Finally! a nice ravine that leads to the main creek! 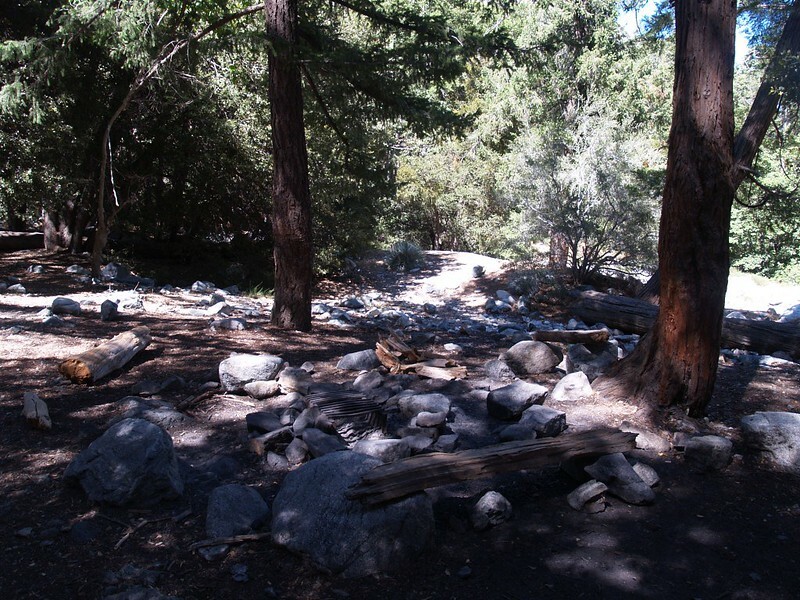 We expected to find Stonehouse Crossing Campground across the creek to the left. 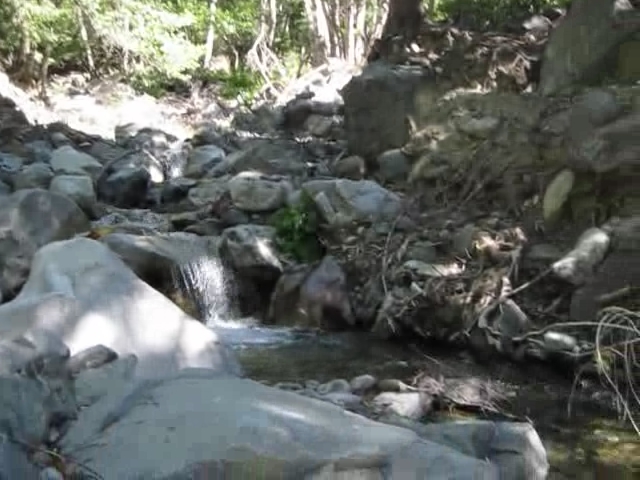 Video of Vicki crossing the creek on a log bridge. 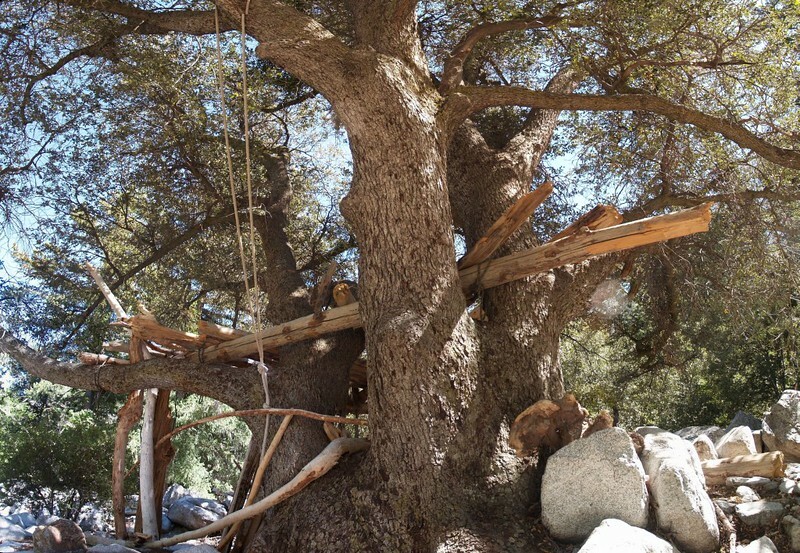 Soon we came upon some obvious signs of humanity: A tremendous treehouse contraption and, not far away, a large open-work teepee, both of these creations a certain sign of the teenage male! 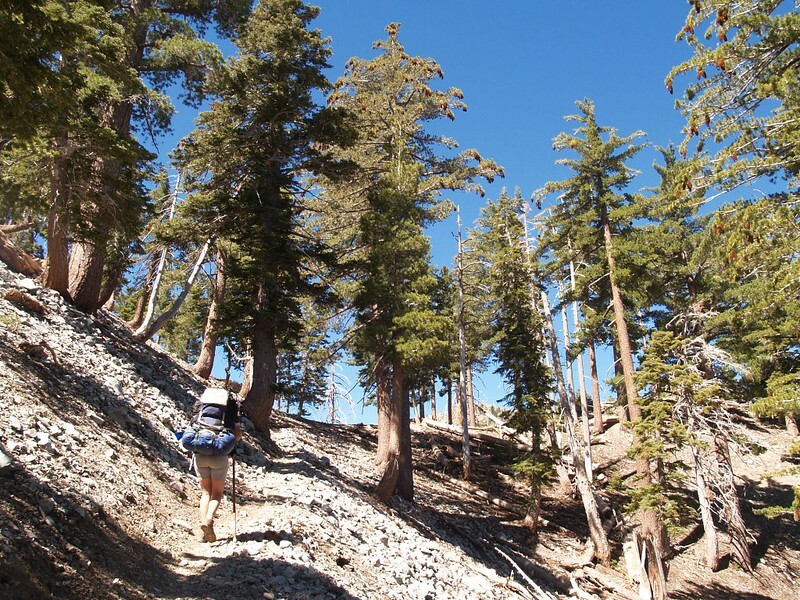 Walking a bit further we came upon a proper stone-lined trail, several fire rings, and many excellent camping spots. Civilization at last! The nightmare had ended! 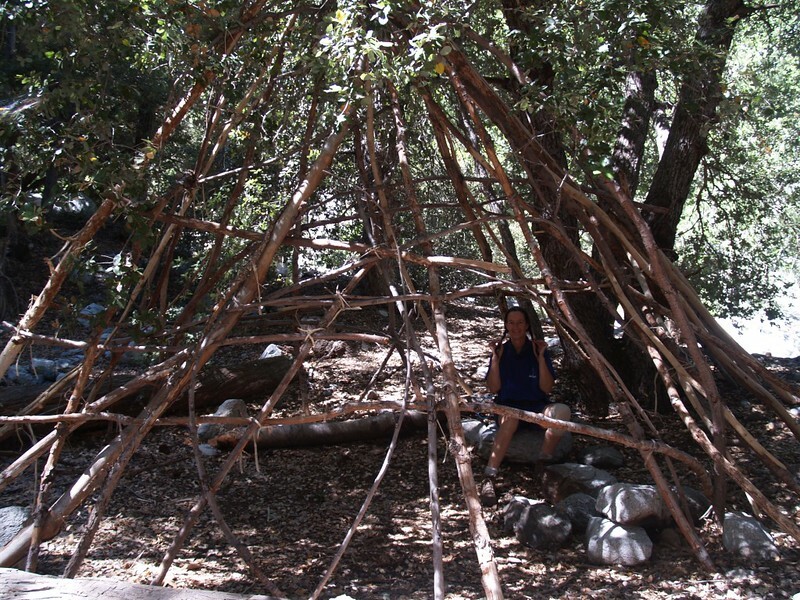 Teepee frame construction: Shelter, without the shelter! At this point, I didn’t really even want to check out the campsite or anything else for that matter; I’d had enough, and I just wanted to be home. But Vicki insisted, and I’m glad she did. 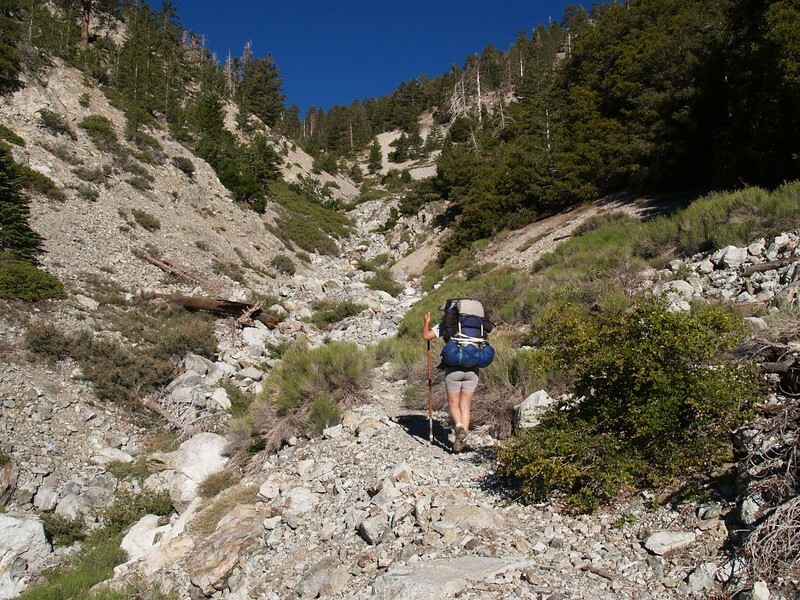 We put down our heavy backpacks and followed the stone-lined trail upstream until we found where it eventually forded the creek. It turned out that it crossed less than a hundred feet from the spot where we were first turned back, not far from the ladybugs! Arrghhh! This was seriously aggravating! 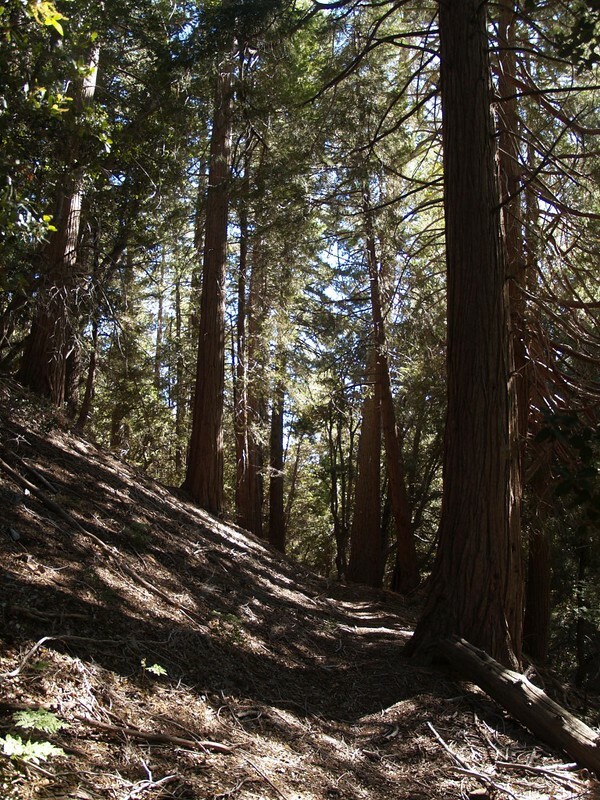 All that bushwhacking and lopping and poison oak chopping for nothing! Yes, I was steamed, but I got over it soon enough. We had a snack and chilled for a while in the campsite. 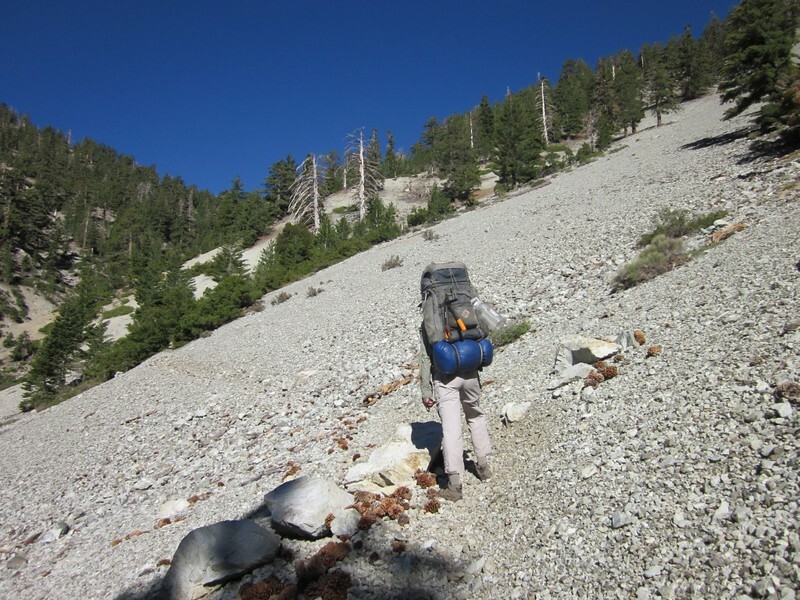 Then we picked up our packs and headed for the car. 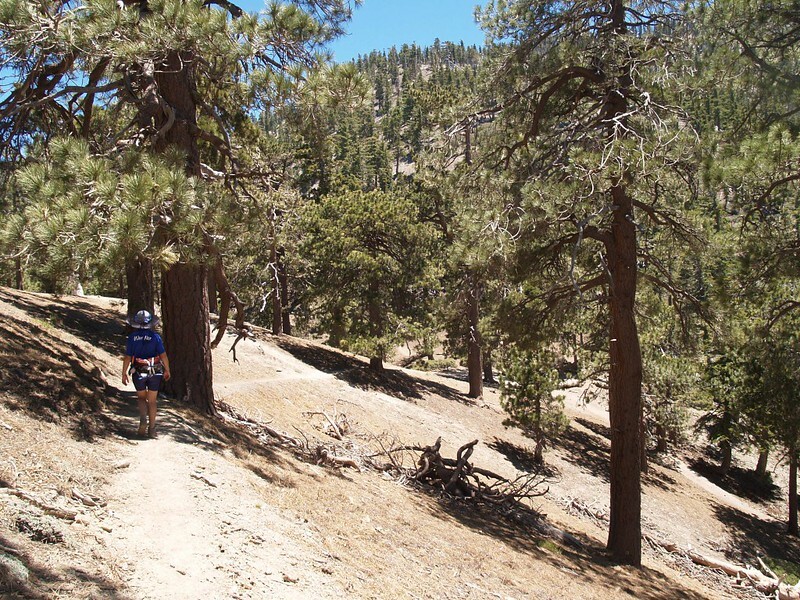 The trail was poorly marked and difficult to find just outside of the campsite, with downed trees and other obstacles, which nearly got us into yet another nightmarish mood, but a few deep breaths and some rational thinking helped us find the main path. It was extremely well-travelled, and easy to hike. Another nice spot to camp. 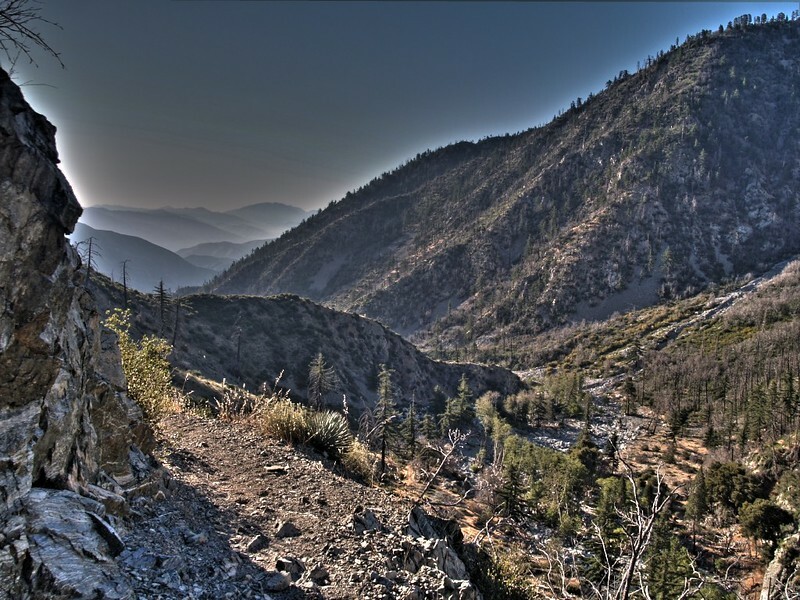 Middle Fork Trailhead – We made it back to the car! We got back to the car about 4:30pm, and began our anti-poison-oak strategy. I stripped off my potentially comtaminated clothes and put on others. Vicki figured that she was already doomed, so she only bothered to cover the car’s seat. We drove down toward I-15, and saw that there were hordes of people parked all along the road; they were either fishing in the creek or swimming. 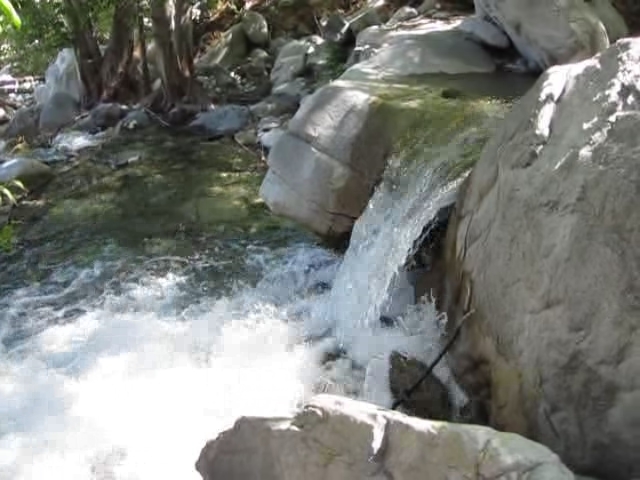 Lytle Creek was a regular party spot on a hot Tuesday afternoon! But we weren’t stopping; we’d had enough of this creek for one day. As rush hour was just beginning, and we had to cross all of L.A. to get home, we stopped and had some dinner. It felt wonderful to sit inside and eat normal food. Solitude was nice, but civilization certainly had its good points! To see the rest of this trip’s photos peruse my Flickr Album. 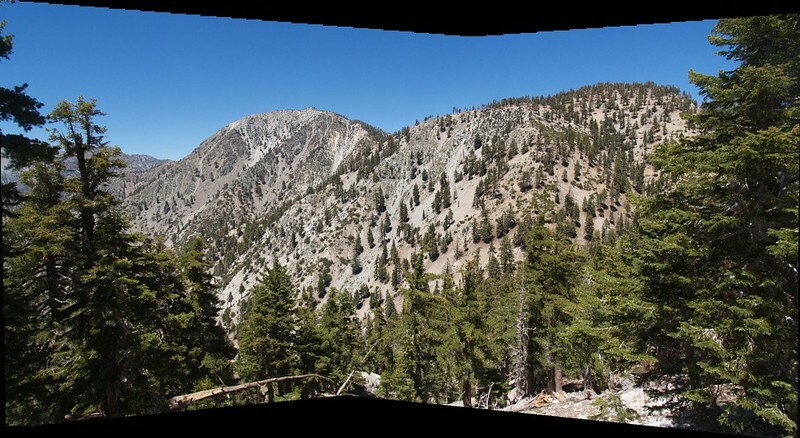 For an interactive topographic map of our hike check out my CalTopo Page.